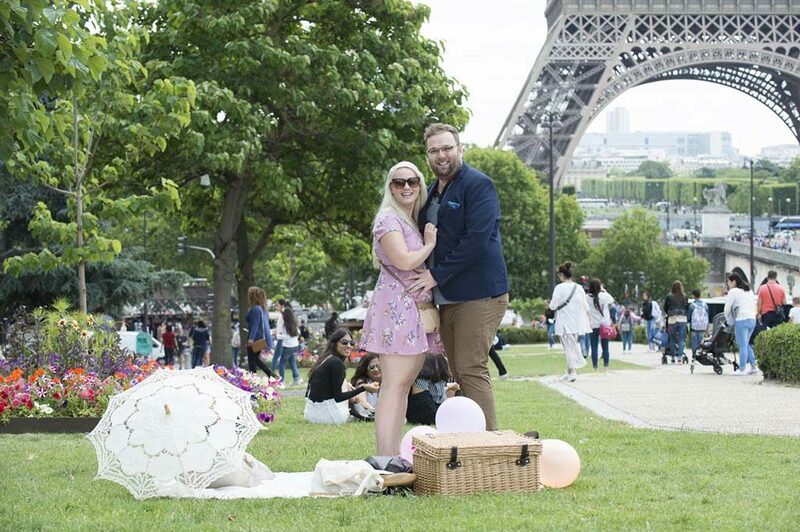 David contacted us a while ago to organize a gourmet picnic for his secret proposal to his girlfriend Tiffany. 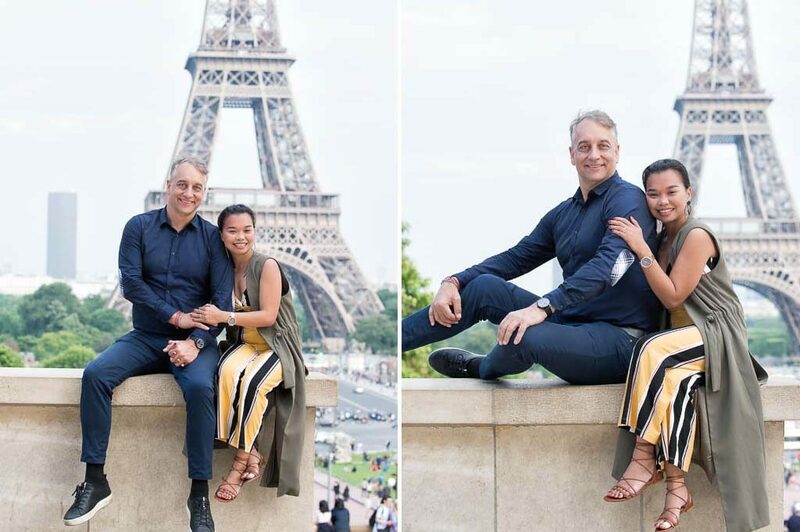 I think the images speak for themselves. 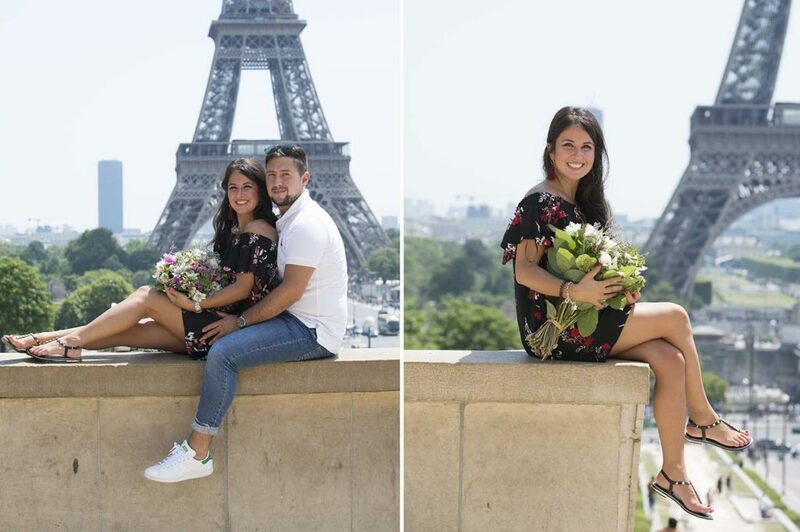 They had a wonderful time at the gardens of the trocadero overlooking the eiffel tower. 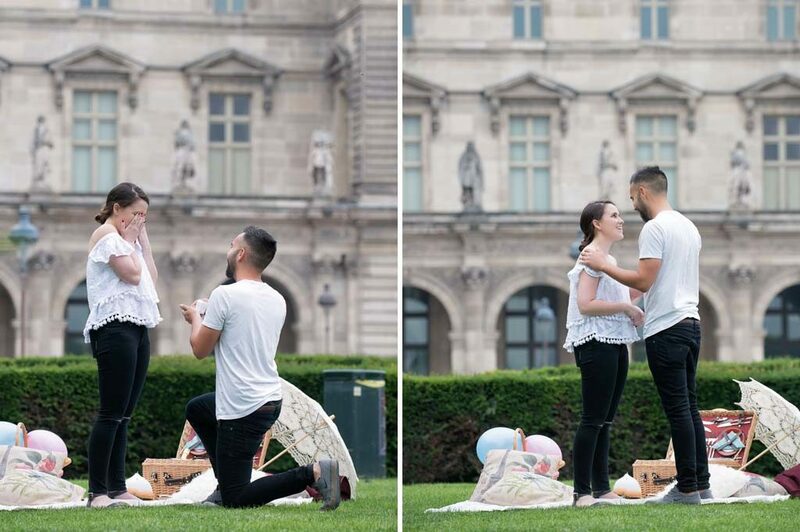 The proposal was a total success. 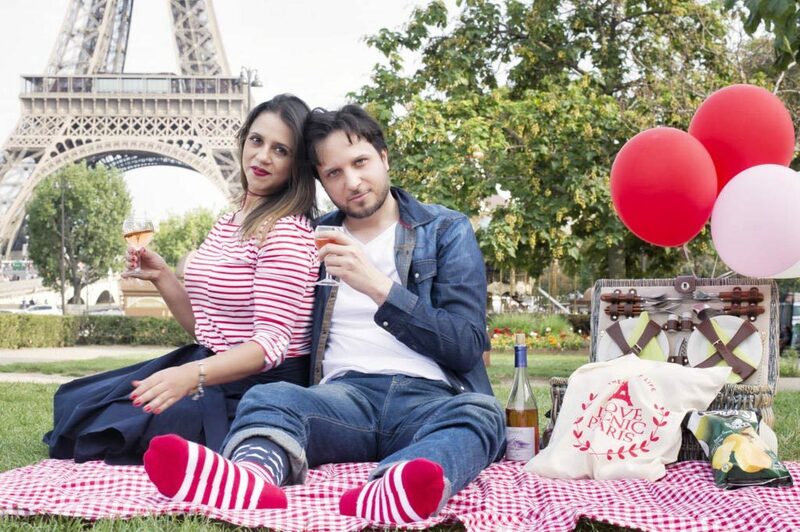 We had organized our Edith Piaf picnic for the occasion with a chilled bottle of champagne and a poenies bouquet. 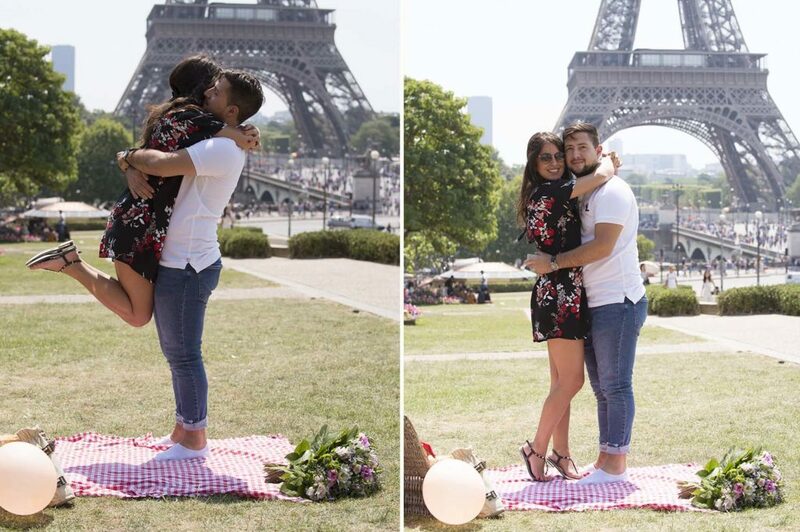 Olivier took some photos discretely from the distance during the proposal. 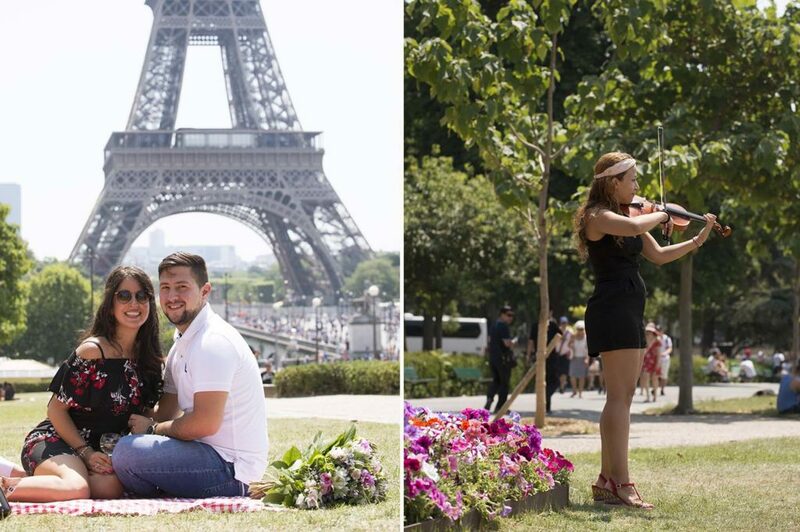 They enjoyed their picnic and had a photo session around the trocadero afterwards. 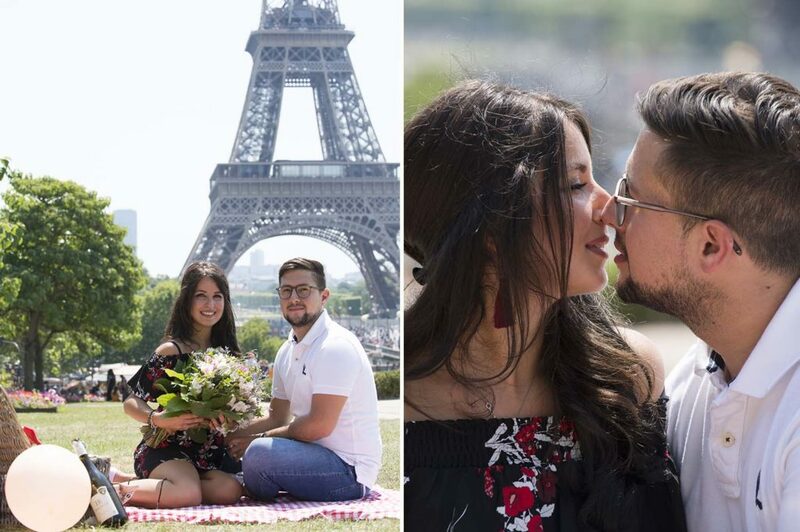 Beautiful afternoon in Paris, we wish them both a wonderful vacation in europe before heading back to Australia and a beautiful life together. 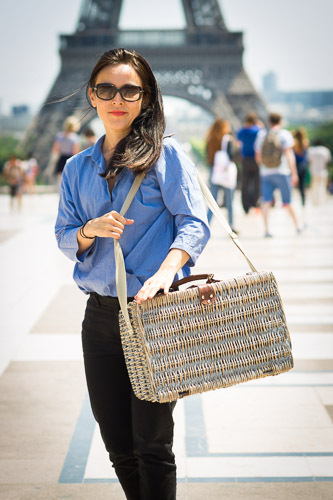 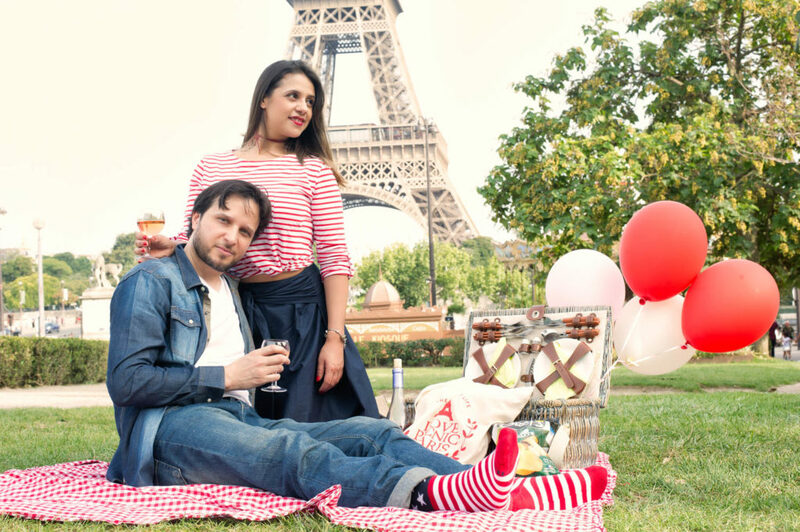 Our Edith Piaf gourmet picnic is the perfect romantic outing to propose to your girlfriend in front of the Eiffel tower. 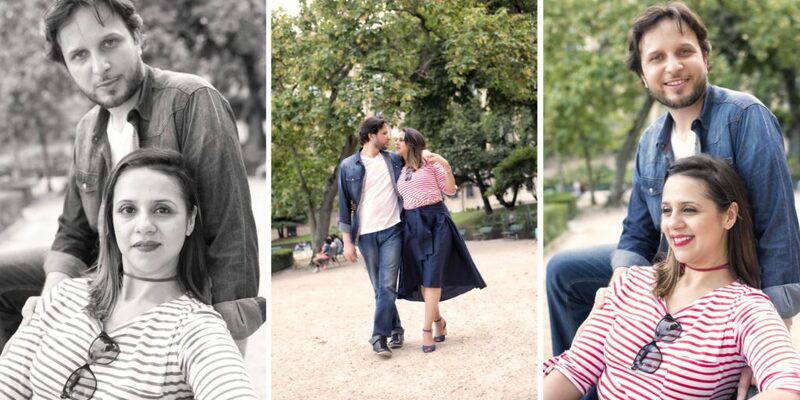 We actually have different packages that can be customized with various photography sessions. 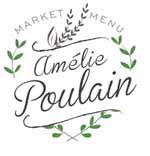 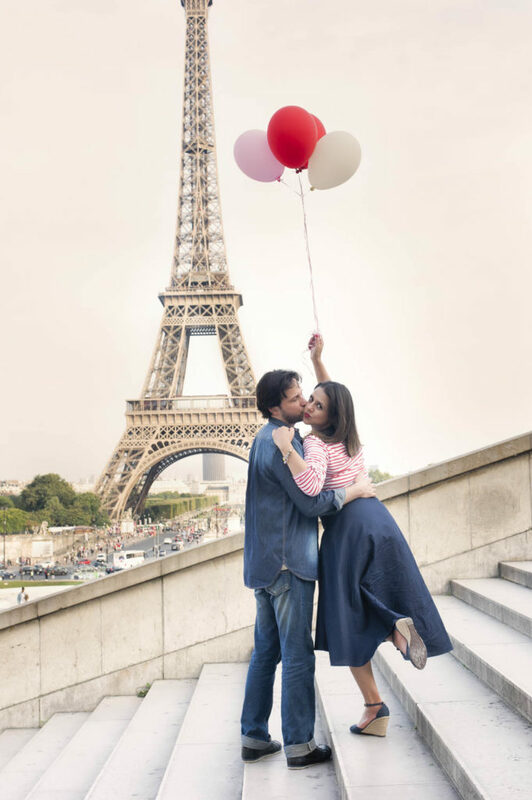 You will find various prices on our Paris secret proposal page. 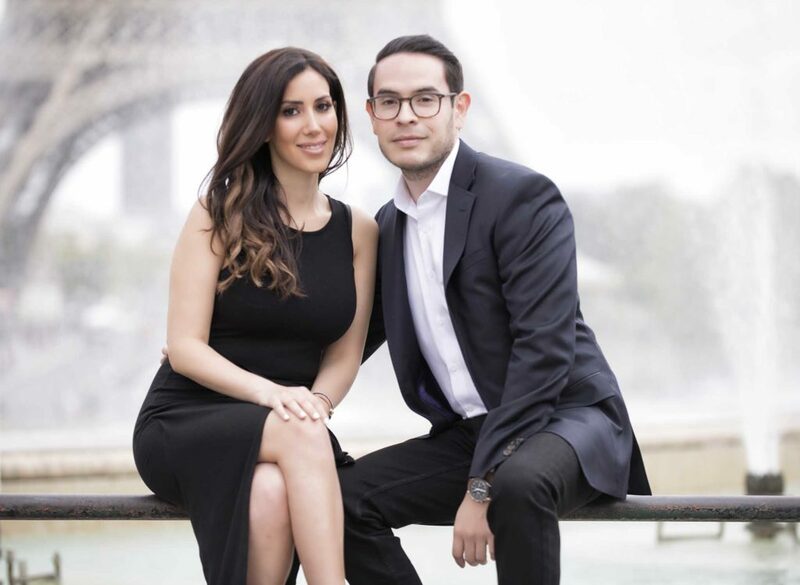 Do not hesitate to get back to us with an email if you have any question that come to your mind. 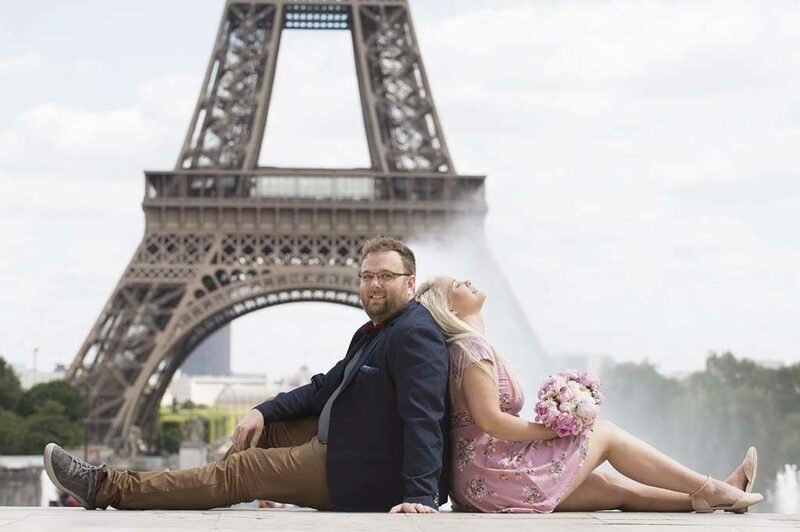 We will explain to you exactly how we can assist you in making this moment unique and unforgettable. 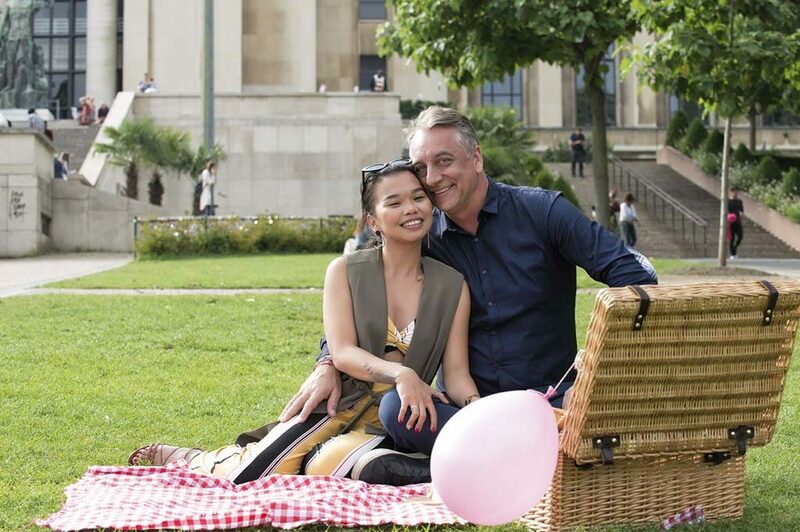 We are so glad that our gourmet picnic / Secret proposal and a photo session with Olivier are getting to be quite popular. 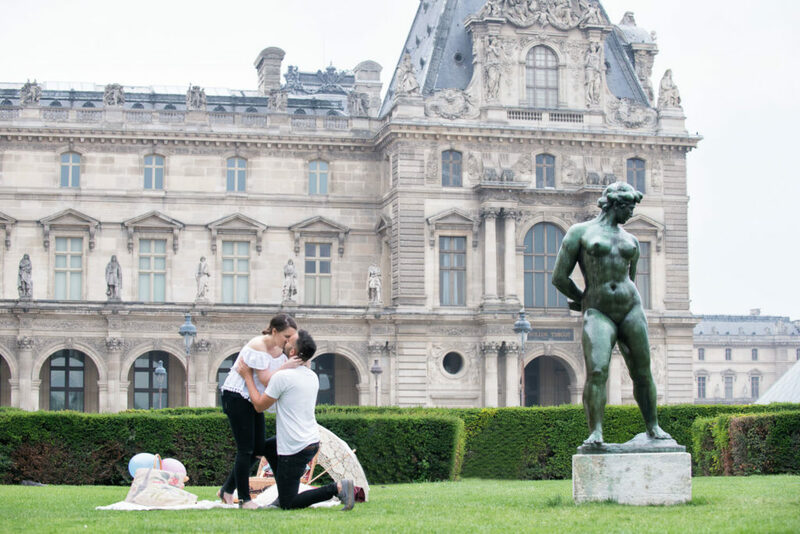 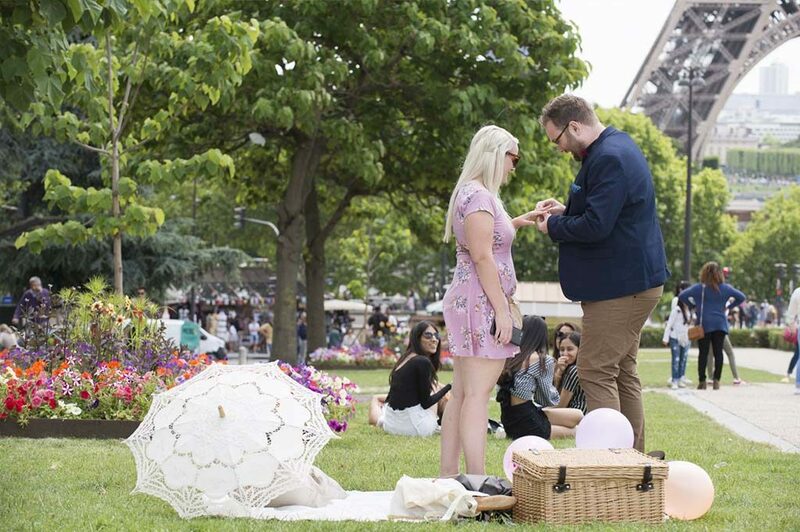 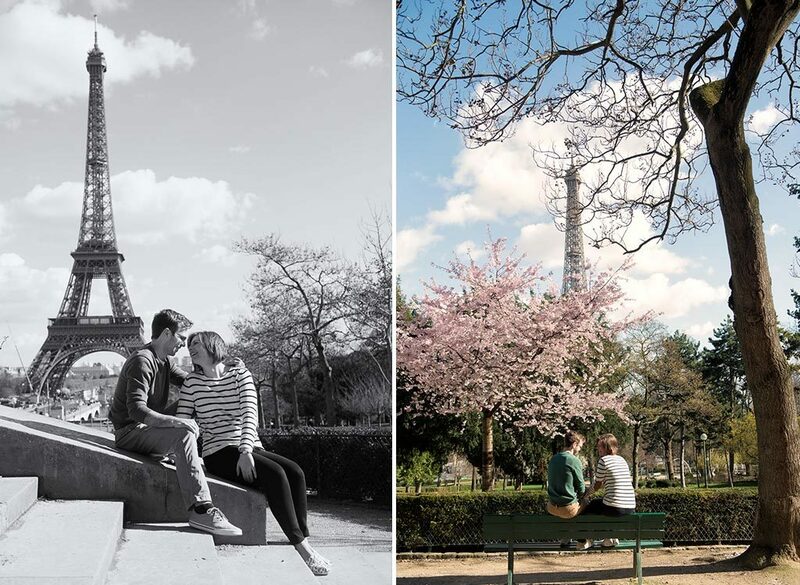 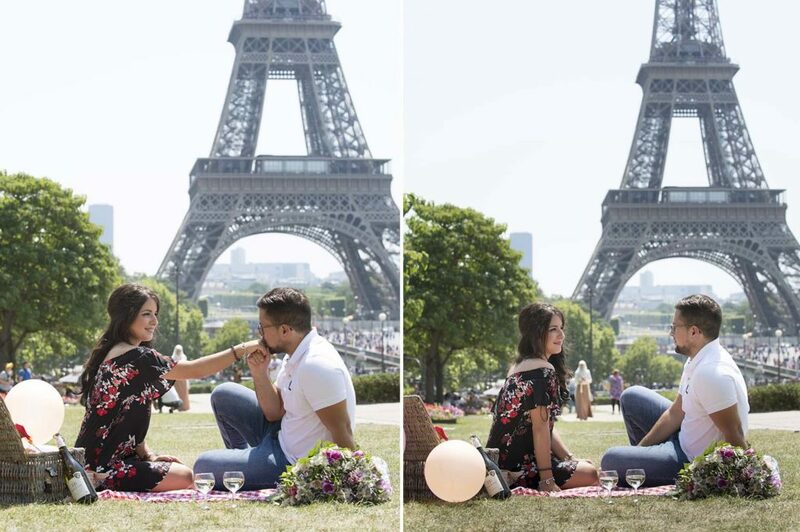 It shows that Paris is definitely “the place” to propose to your love one! 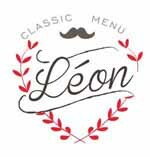 100% success guarantee so far. 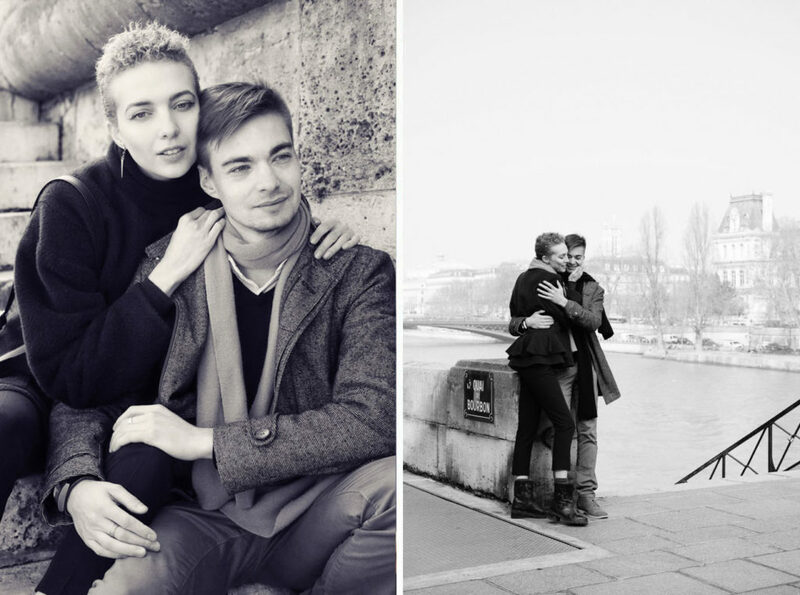 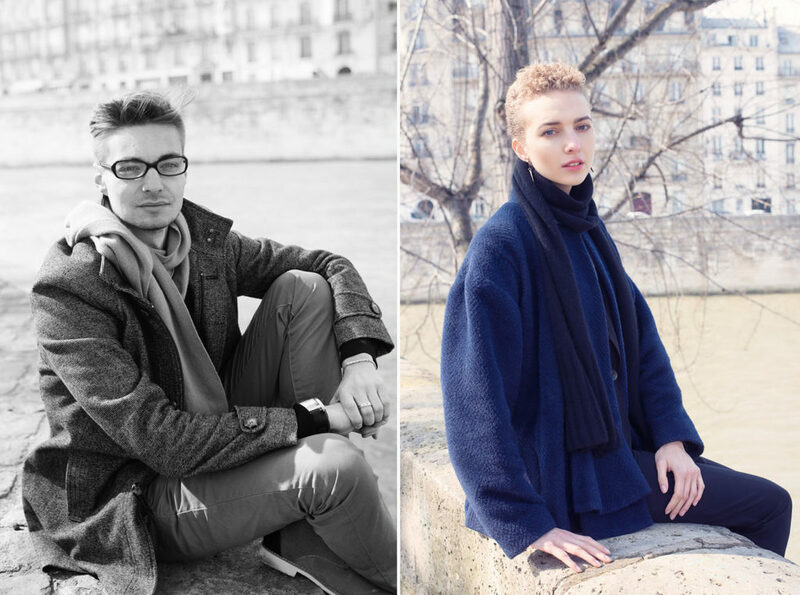 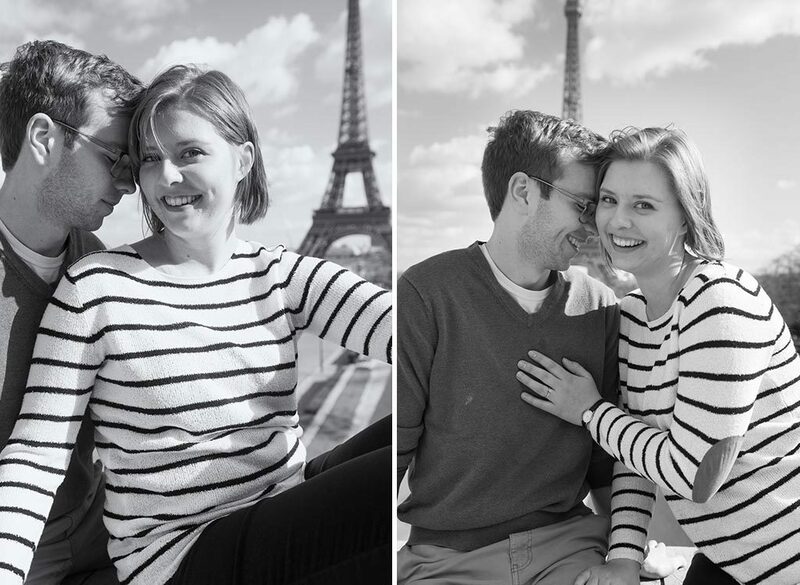 Enjoy this serie of photographs taken with one of dear couple at the trocadero a few days back. 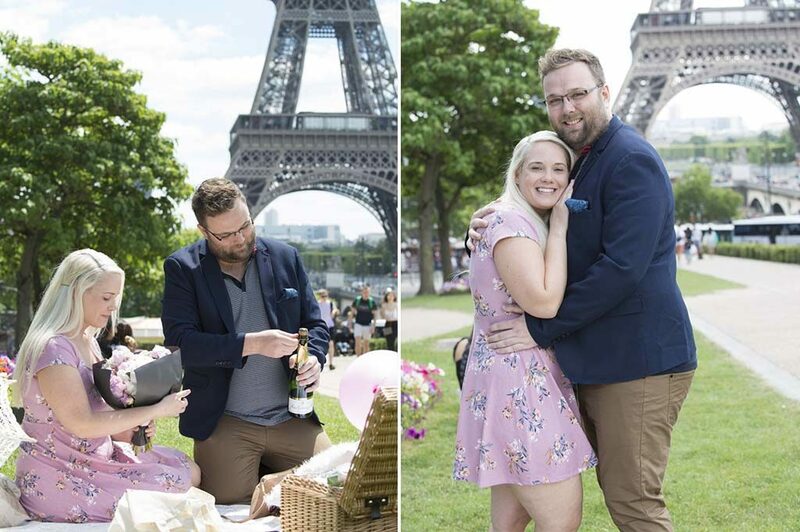 I want to thank you both for making my surprise proposal to my girlfriend (now my fiancee) a fantastic experience and the most memorable day ever. 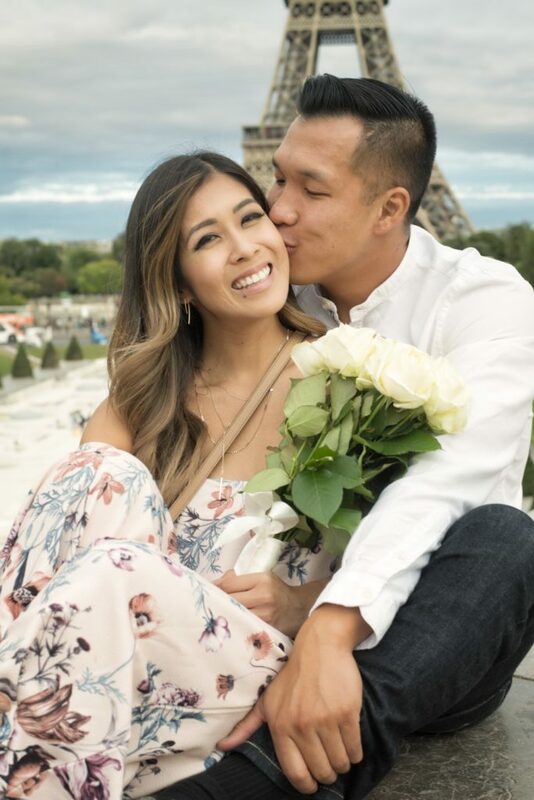 From the first contact they were so helpful in assisting to plan the event and come with many suggestions that made the day even more memorable for us. 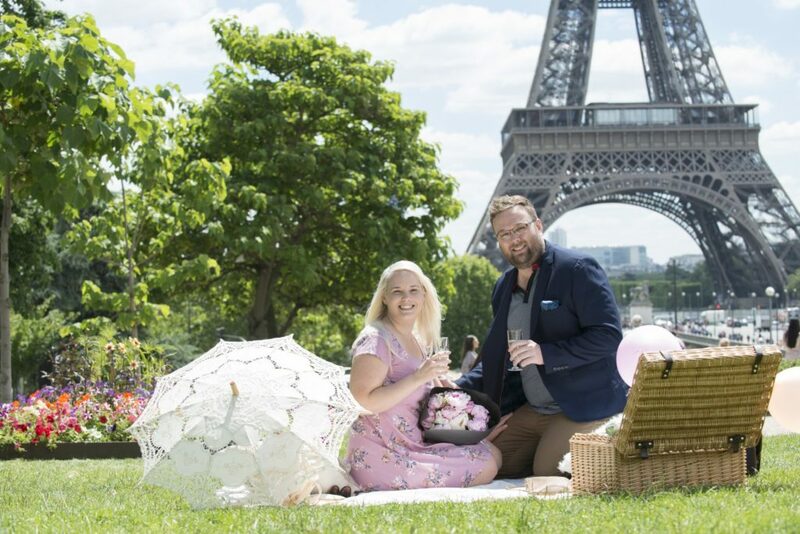 The picnic set up and food was fantastic, location was perfect and they even made sure the rain stopped in the afternoon so we could have our picnic outside as planned :-). 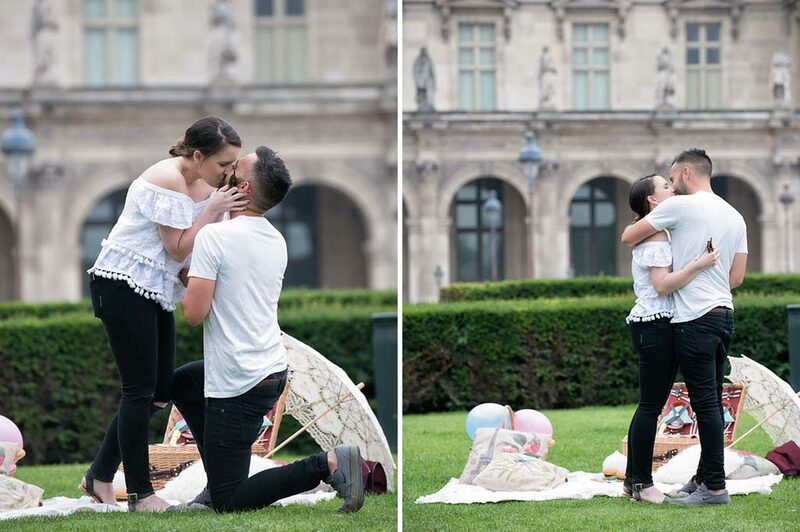 Oliver took pictures of us when I proposed and captured “A perfect moment” that we will cherish for ever. 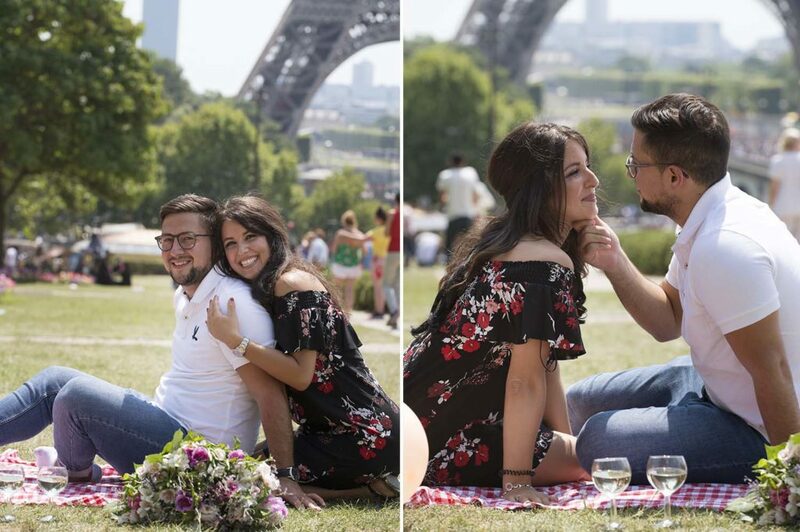 He continued to take pictures during our picnic and then also came back after for an additional photo shoot which I strongly recommend you take if you book “Love Picnic Paris” which I absolutely recommend! 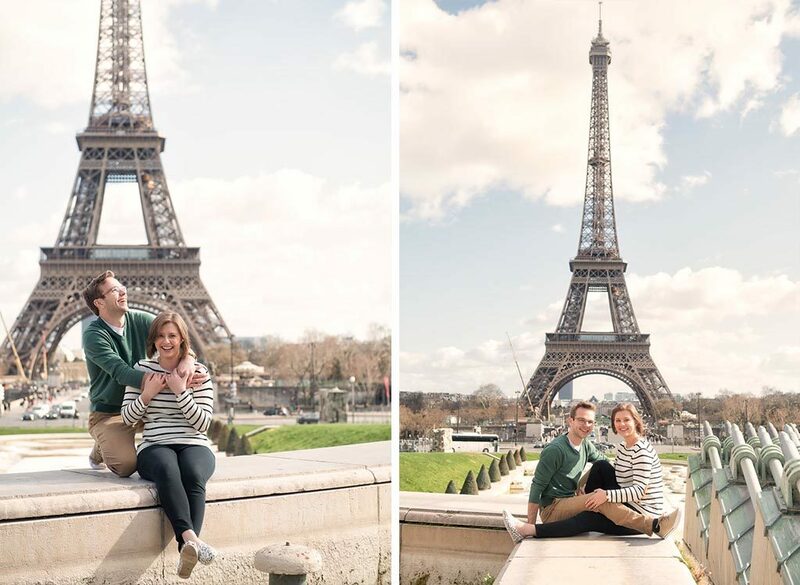 The pictures we received after just a few days are the best and Oliver is excellent in setting up the right poses and settings for the best pictures. 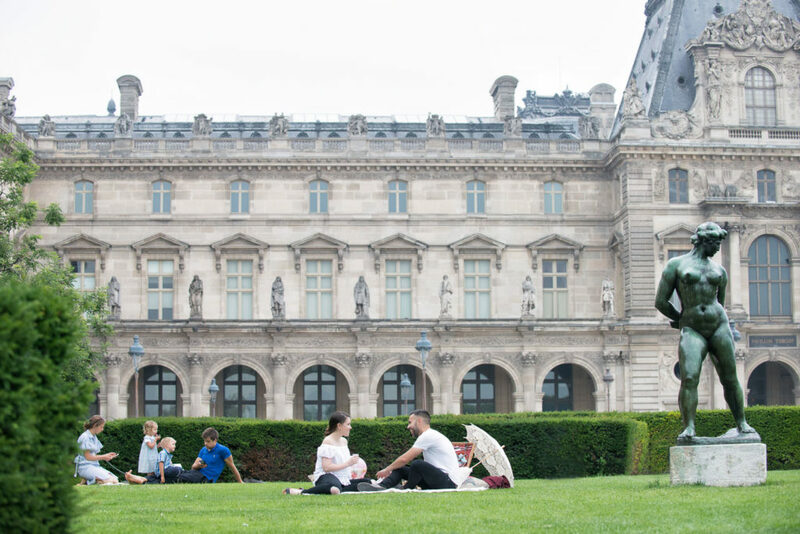 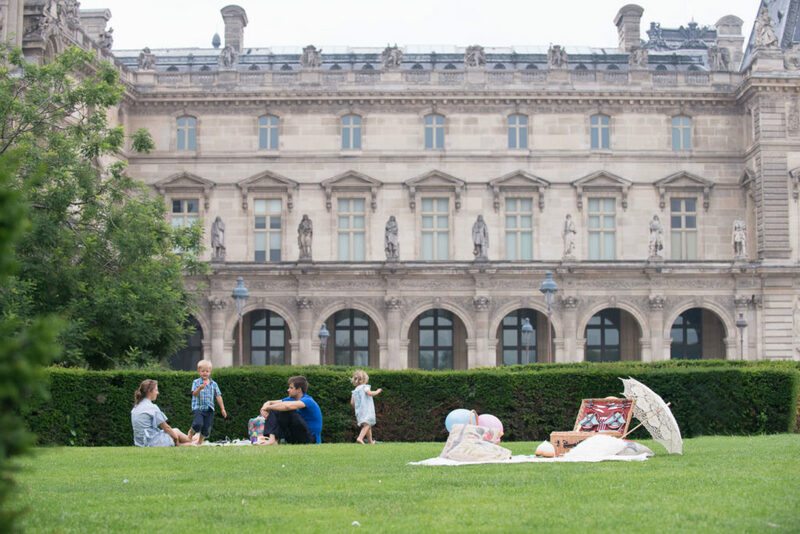 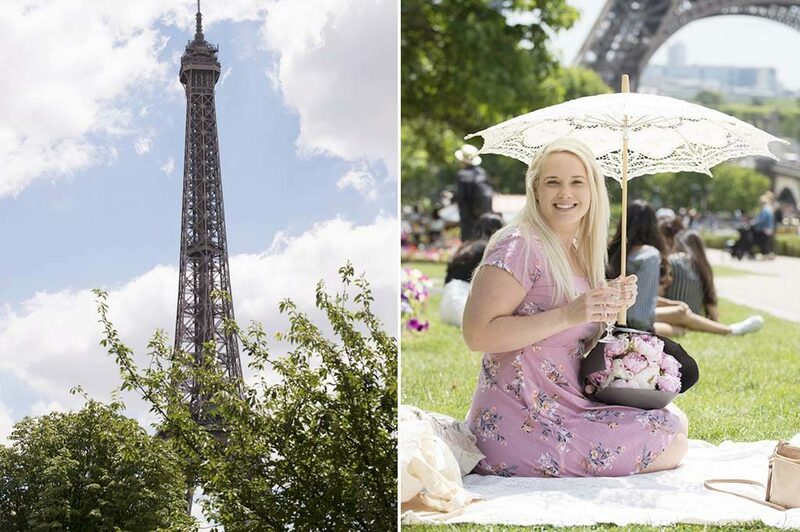 If you are planning a surprise picnic/event/photo shoot I hope you use “Love Picnic Paris”, you will not be disappointed and will have a memory for a lifetime. 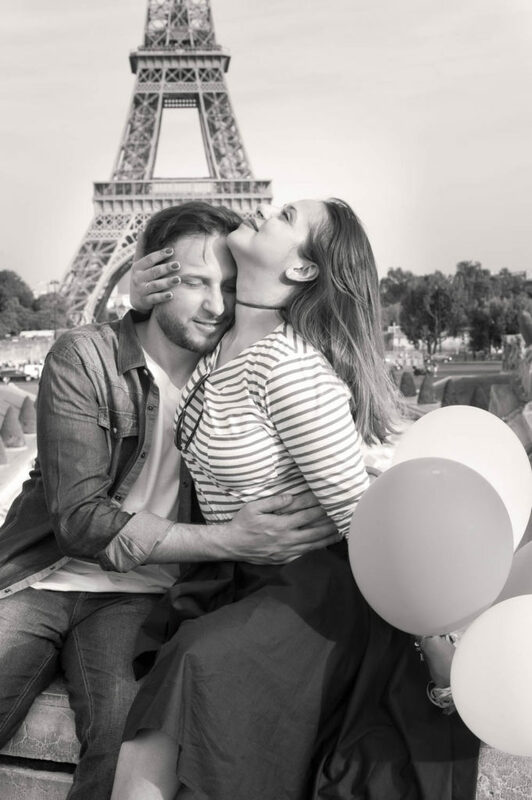 Once again thank you for “A Best Day”! 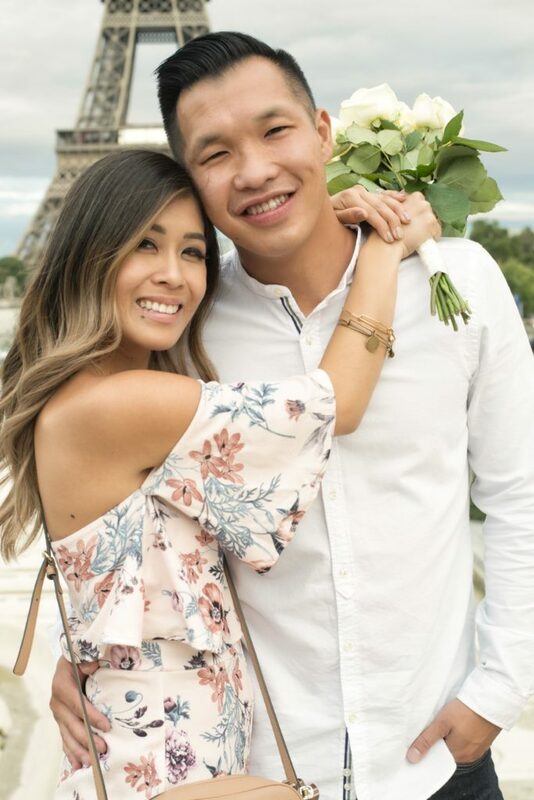 SWEET, we are so glad we were able to make it all happen for them. 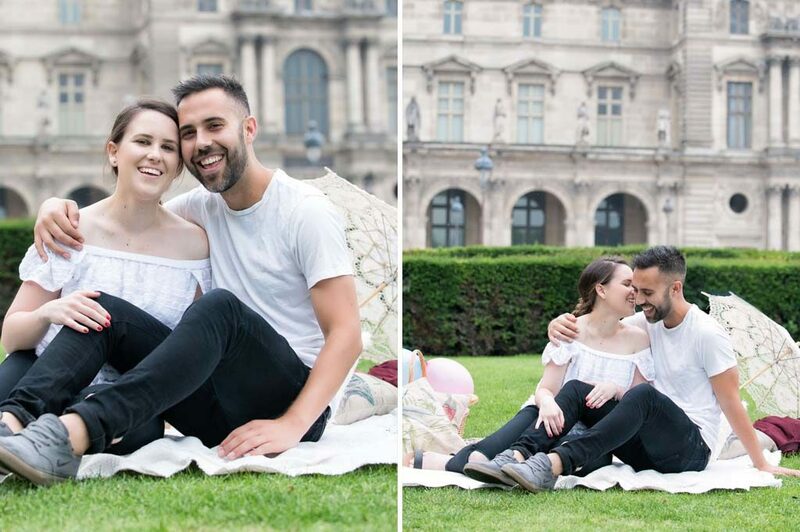 We prepared a Vegan gourmet picnic for Marthy and Meg a few days ago at the gardens of the Louvre. 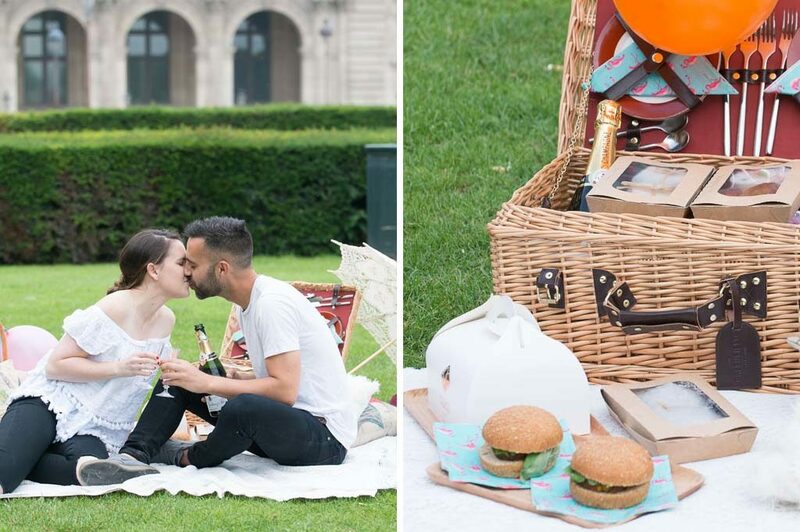 Marthy had reached out to us to ask whether we could possibly arrange for a vegan picnic for his surprise proposal. 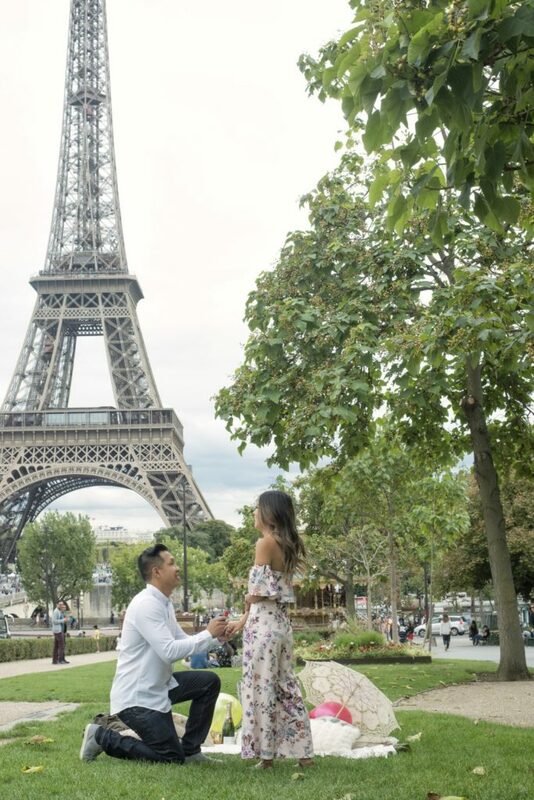 WE said ” YES” why not! 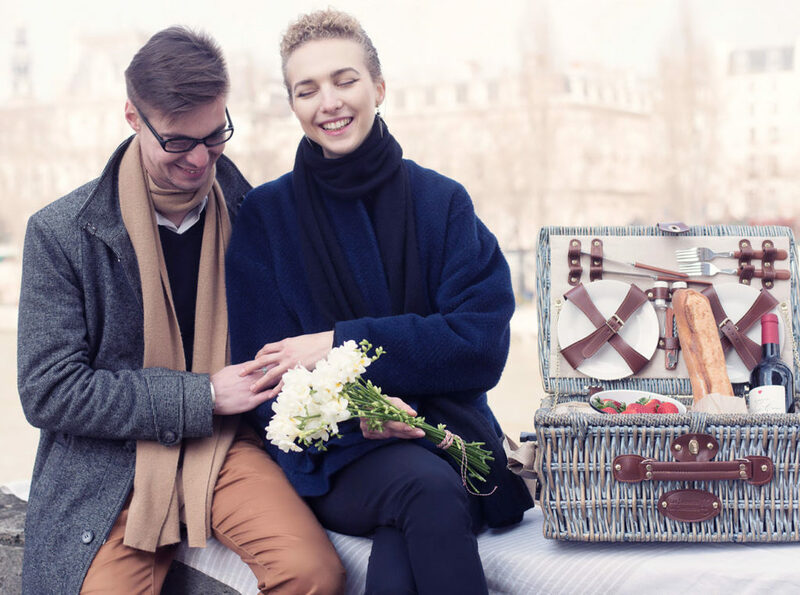 Not being fluent in the art of preparing a vegan picnic, we went around town to a few vegan stores and discovered how this trend is quickly developing in the city with vegan bakeries, restaurant and food stores as well as a cool tea shop on rue Voltaire in the 11th where we purchased a selection of vegan cakes which we of course had to try ourselves. 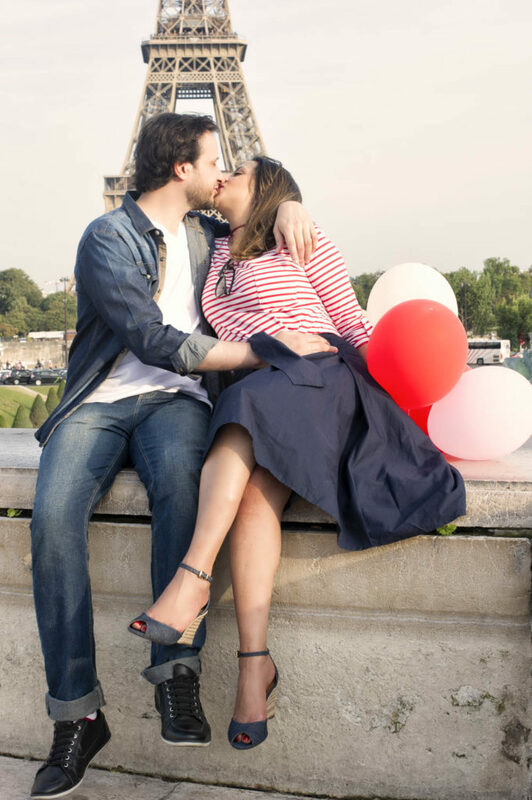 AND yes happily surprised we were after all. 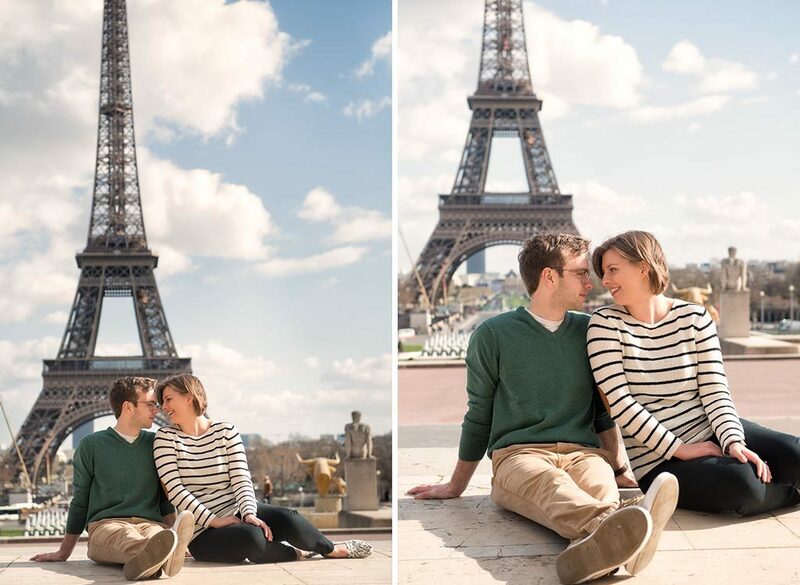 Below a few of the photographs taken by Olivier during the proposal. 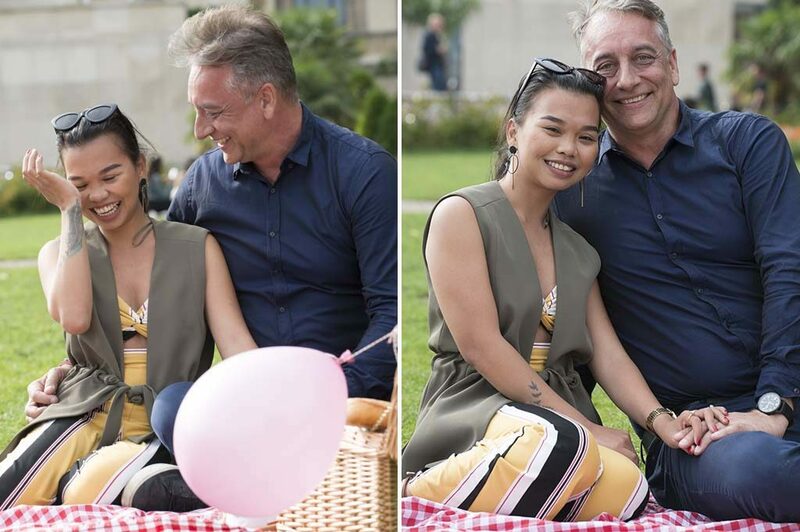 They looked so happy together, the photos are gorgeous and they enjoyed their vegan picnic. 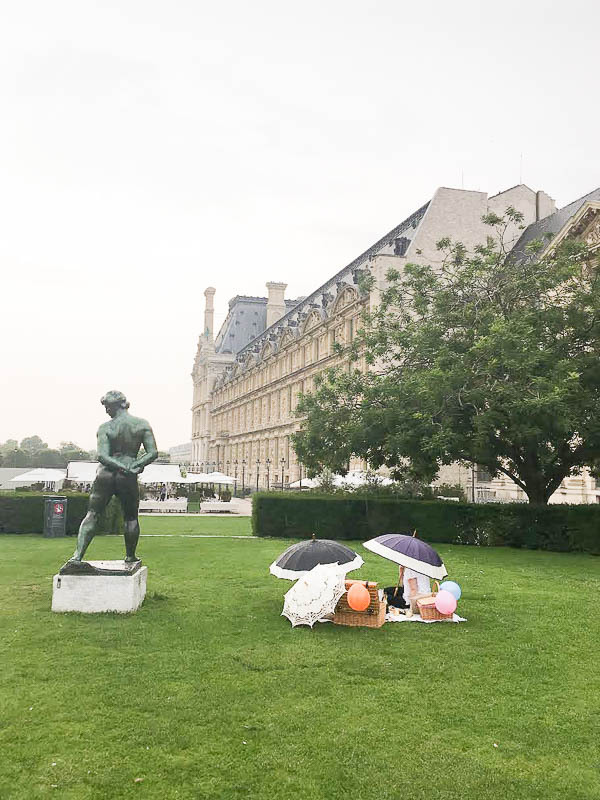 It started raining towards the end of the picnic so Olivier rushed to the car and grabbed a couple of umbrellas which he dropped off to them. 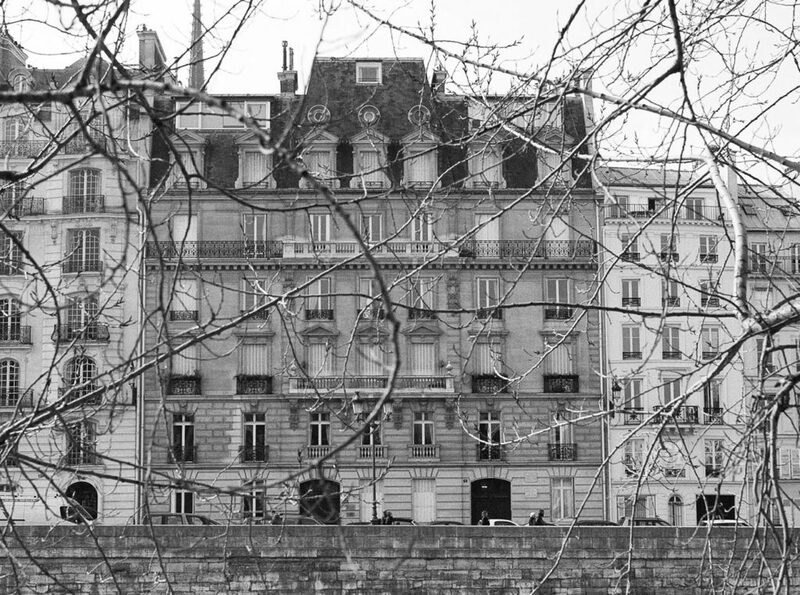 He snapped a photo with his iphone as he was leaving. 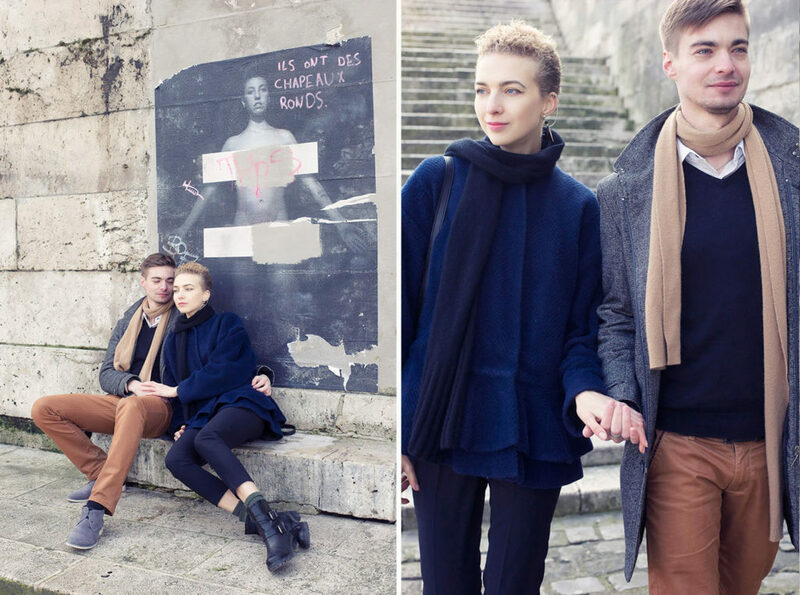 So cool …. 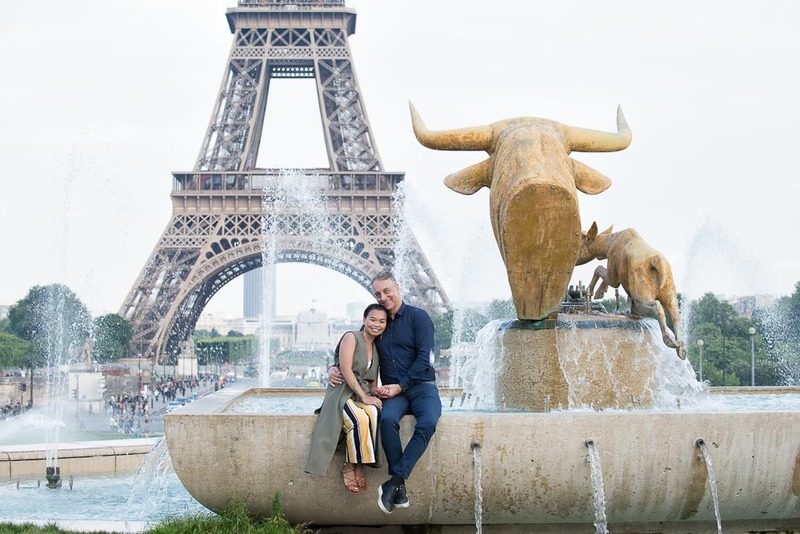 The rain did not stop them from enjoying their gorgeous evening in the city of love! 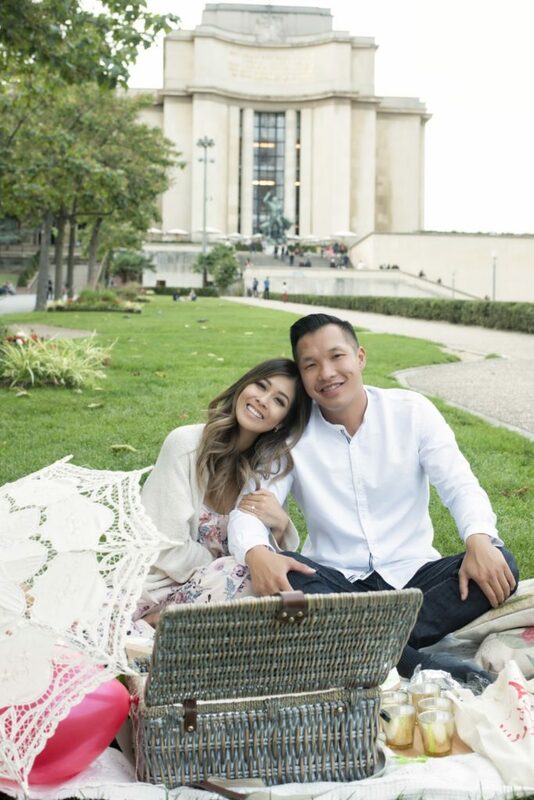 Anthony + Isabel at the Trocadero gardens. 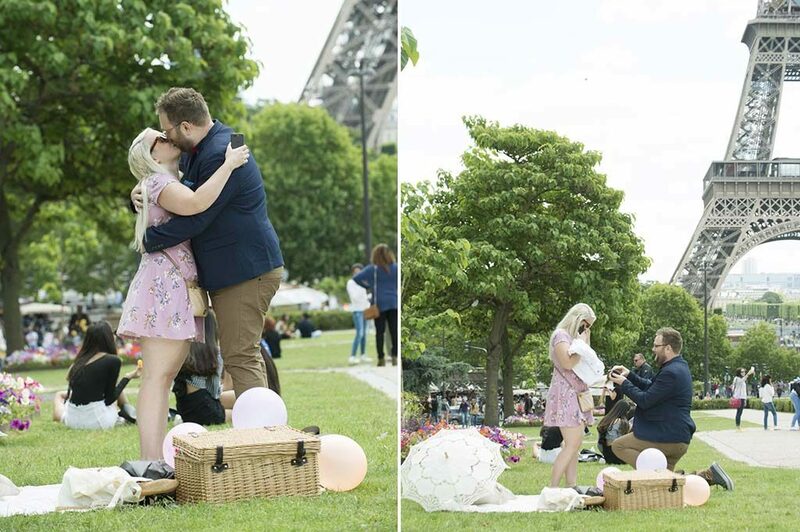 Anthony had contacted us to help organize his secret proposal to his long time girlfriend Isabel. 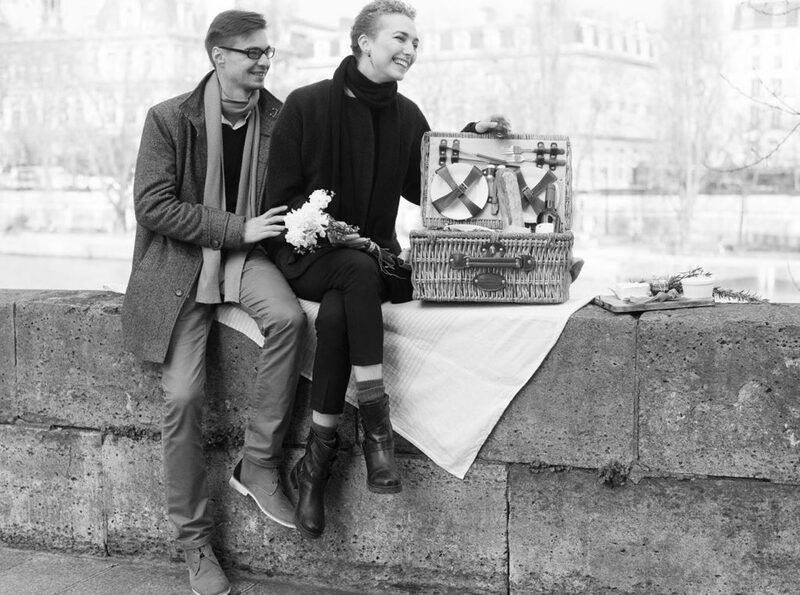 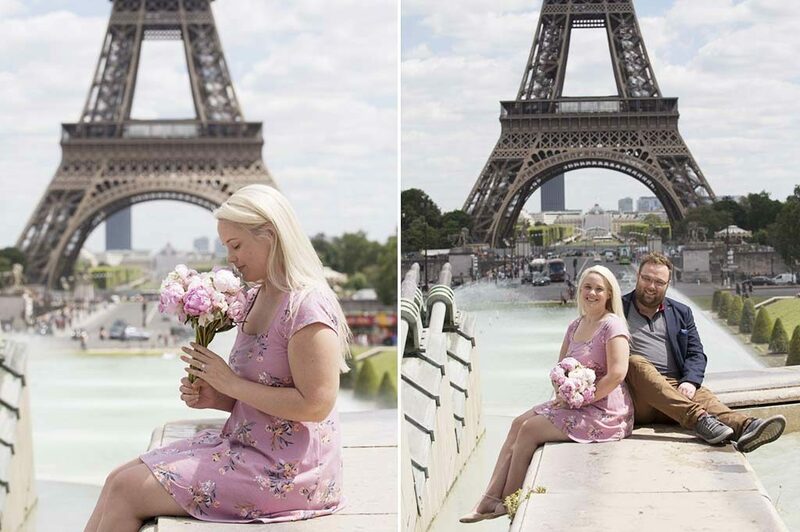 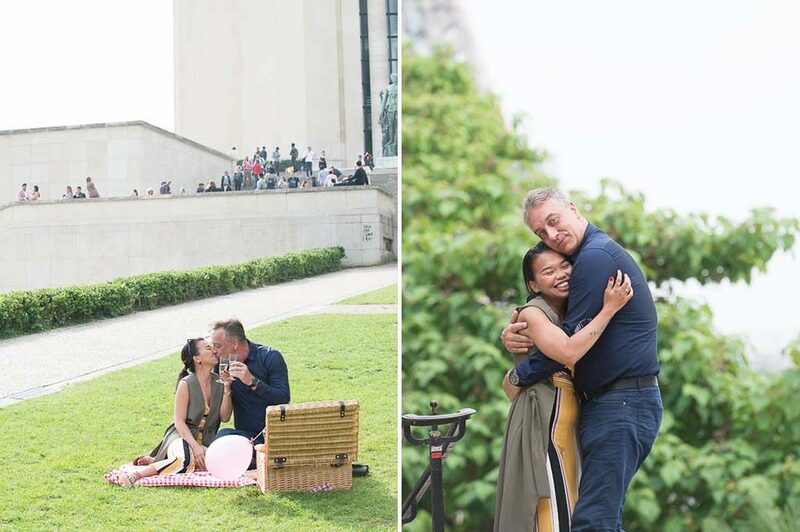 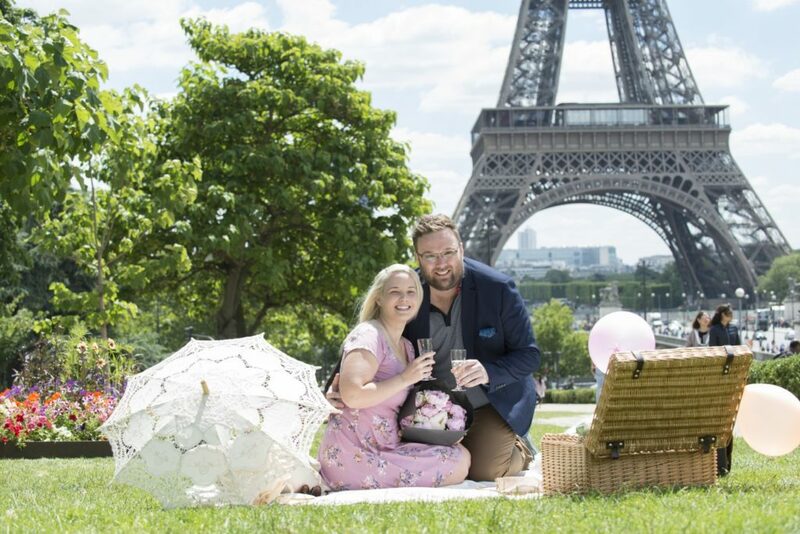 We organised a picnic for them overlooking the Eiffel tower and Olivier was present to photograph the secret proposal and take a few portraits of the two of them around this gorgeous location. 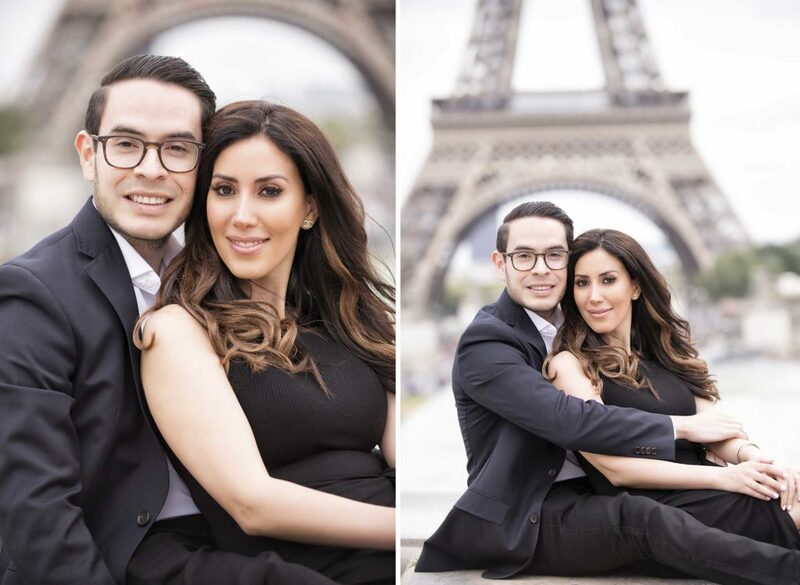 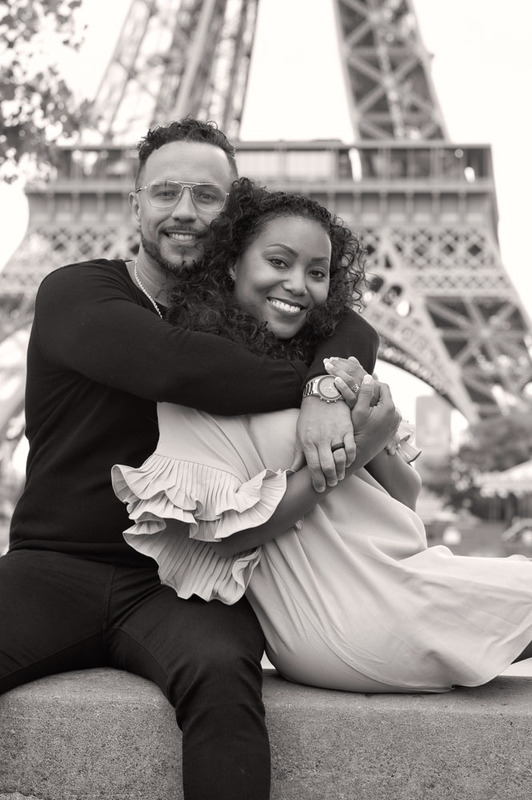 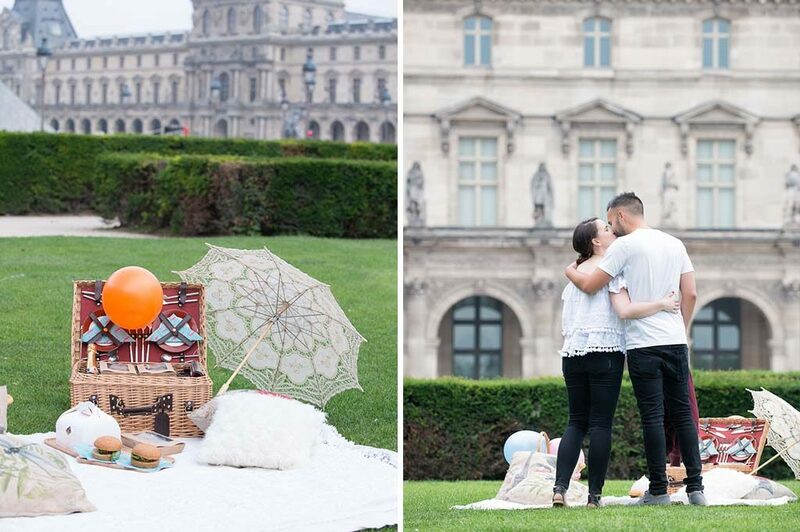 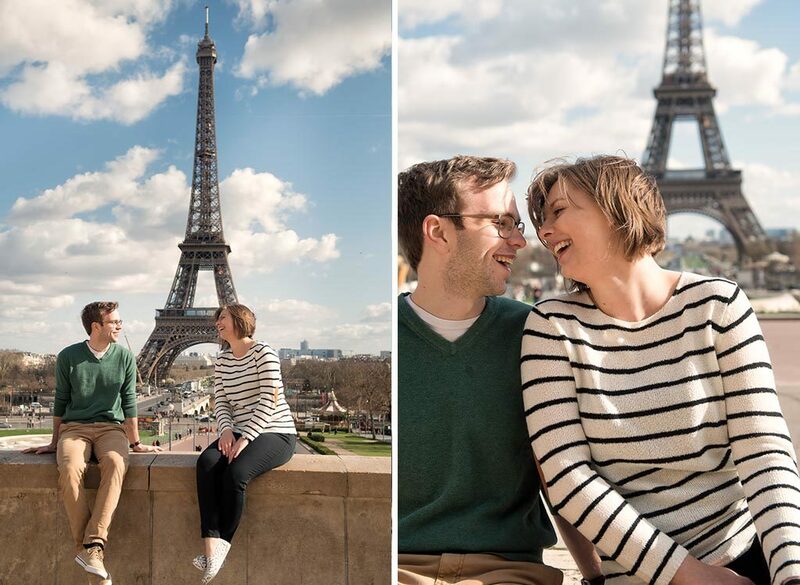 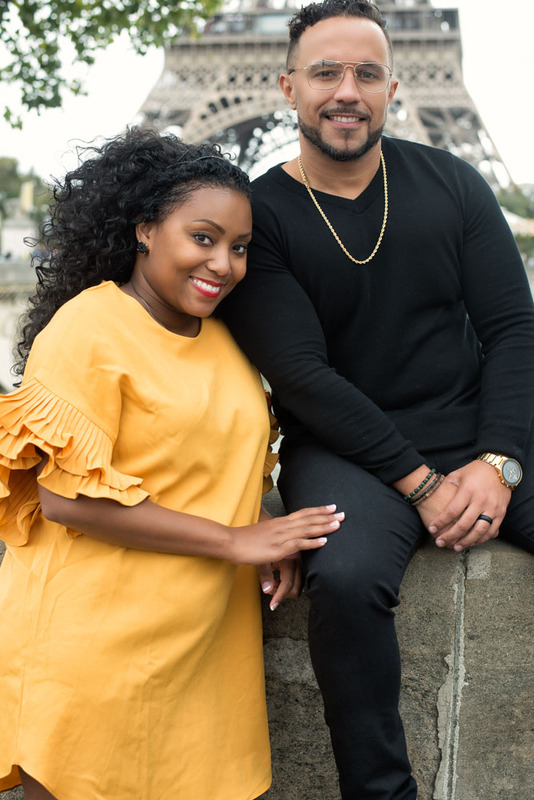 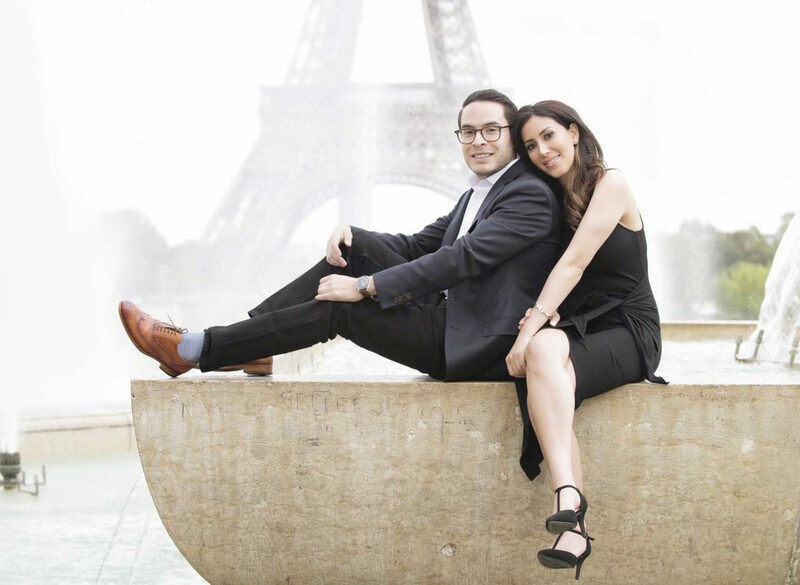 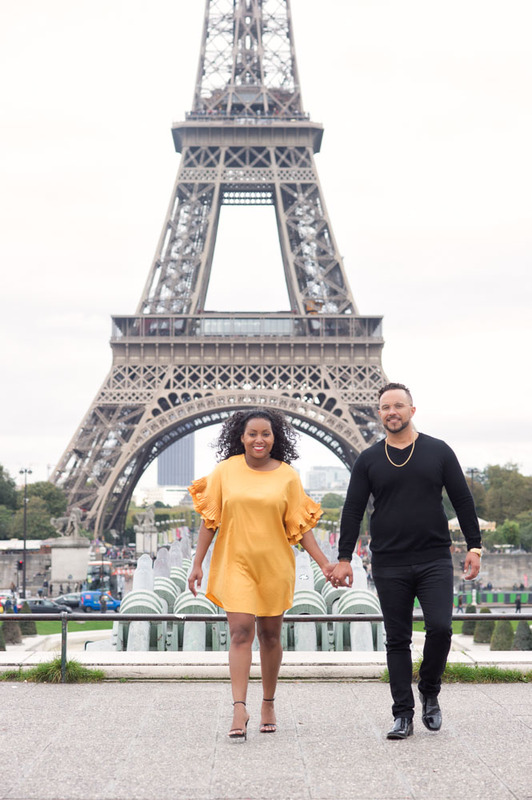 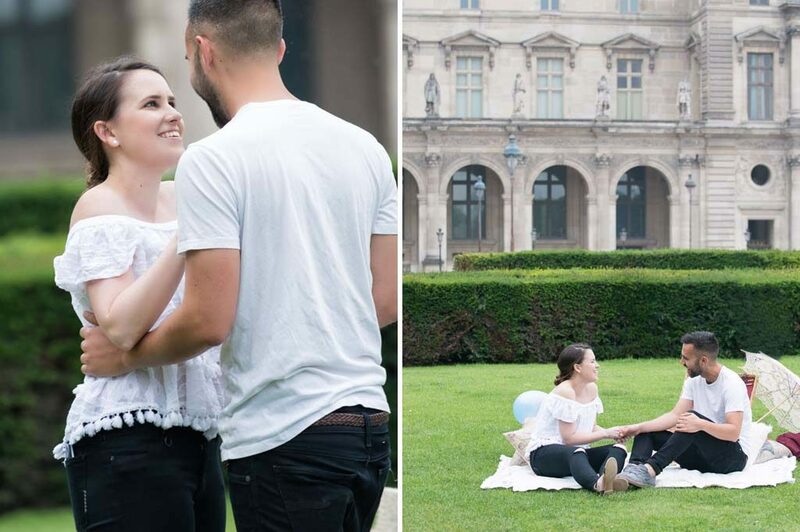 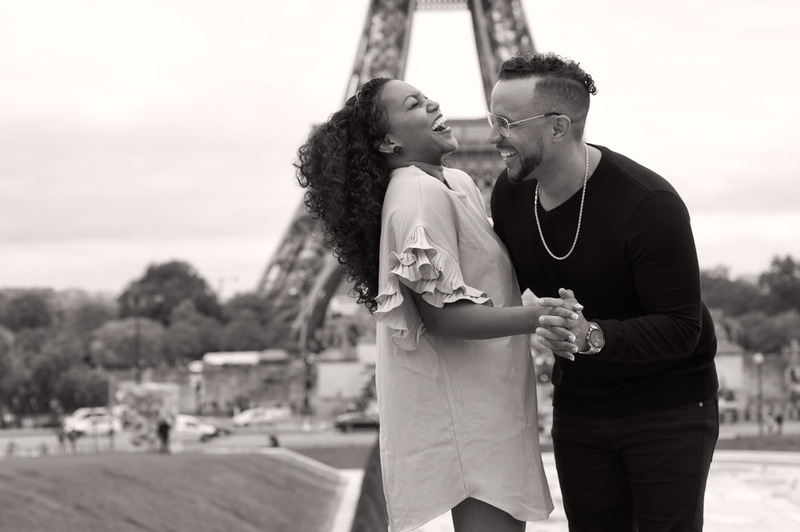 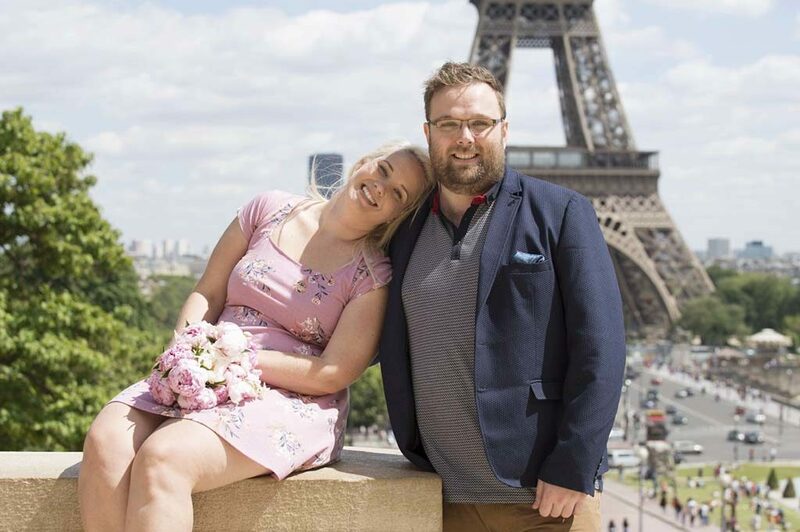 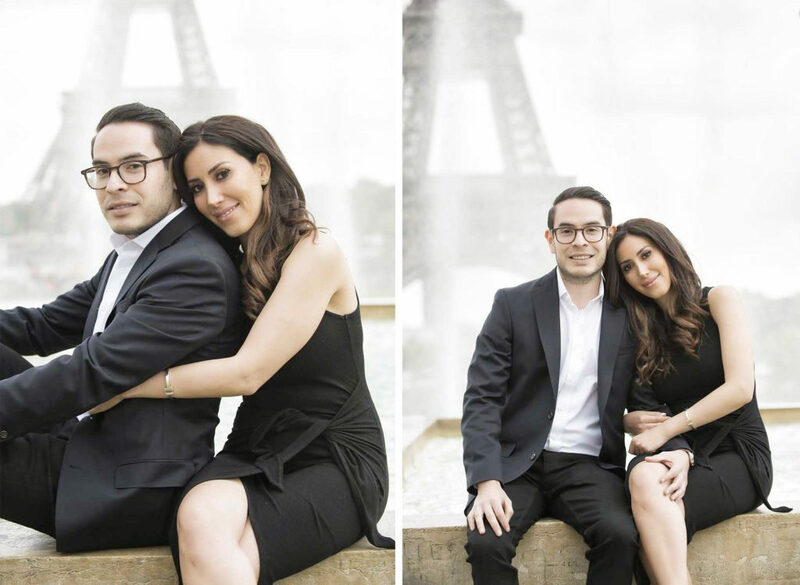 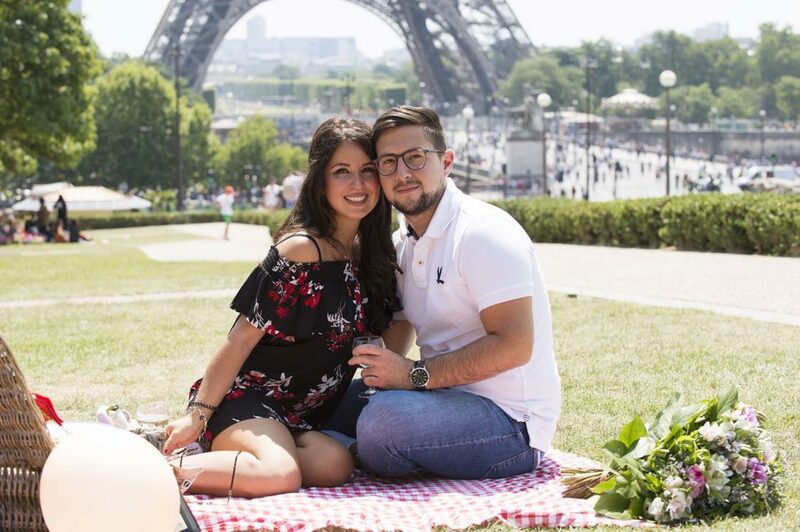 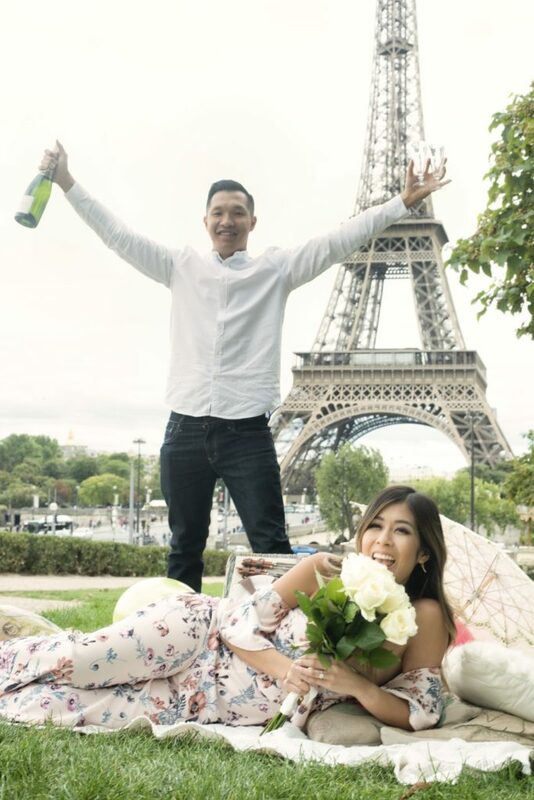 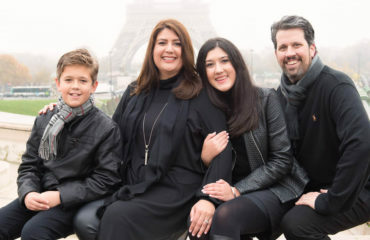 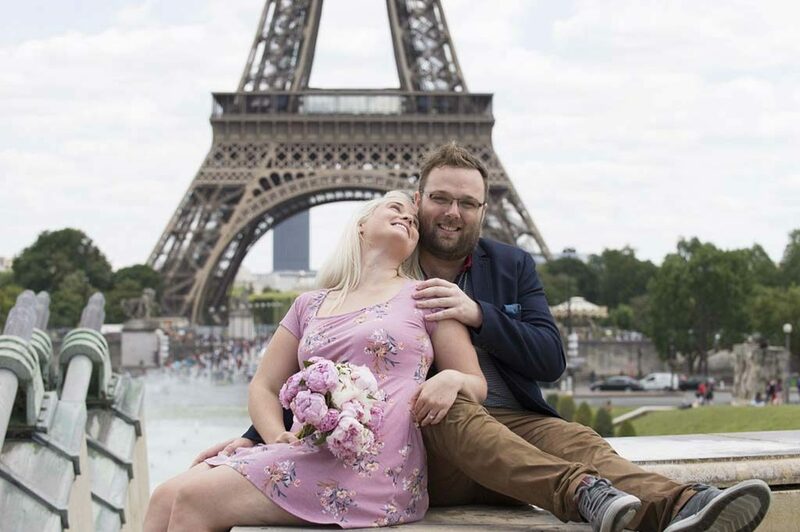 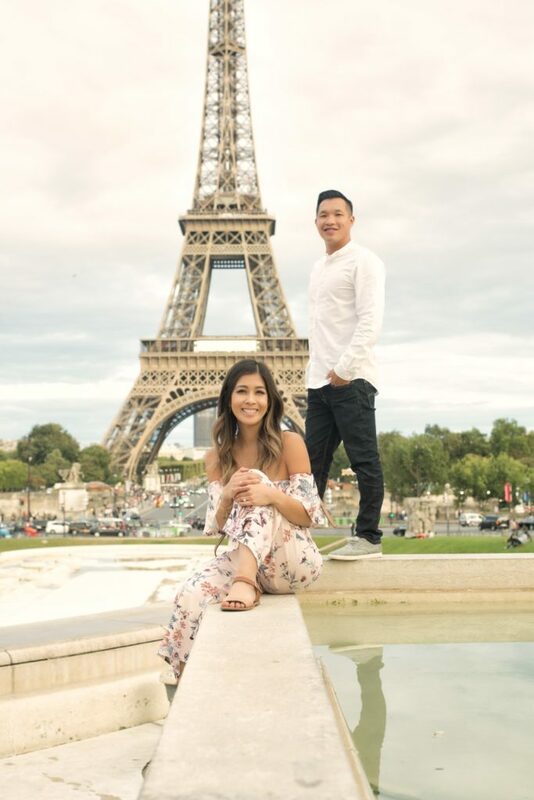 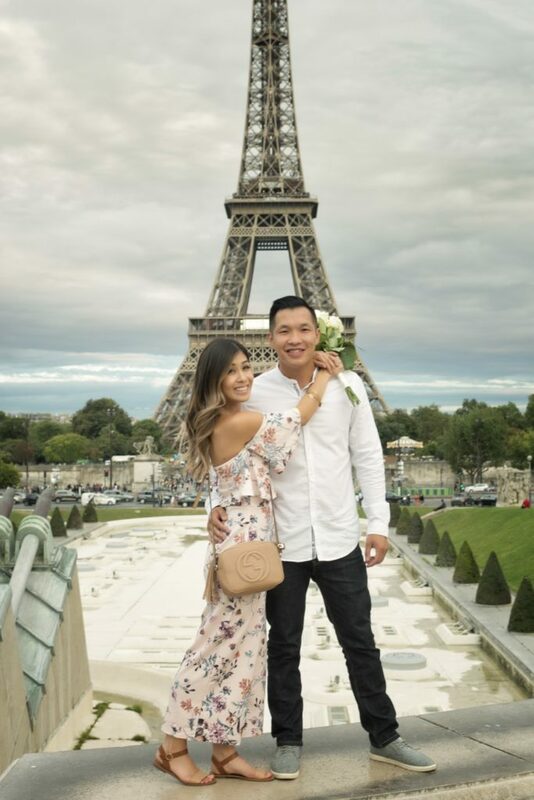 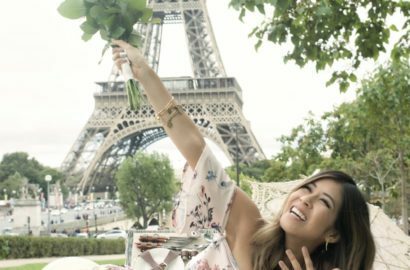 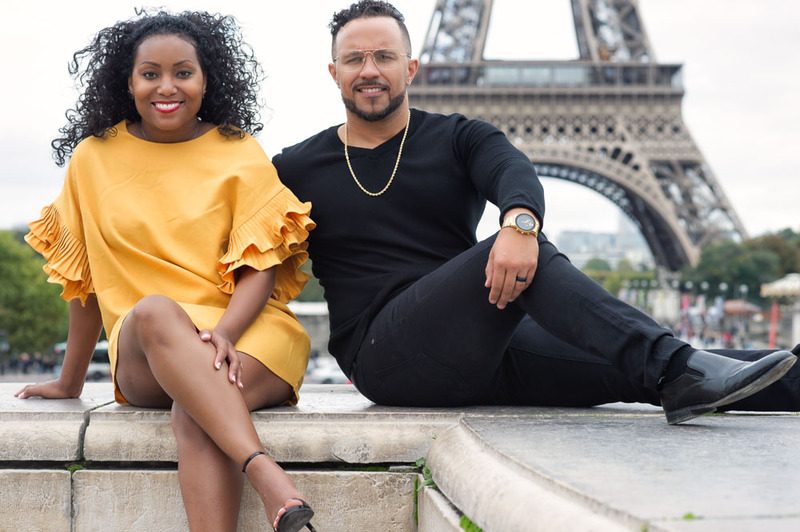 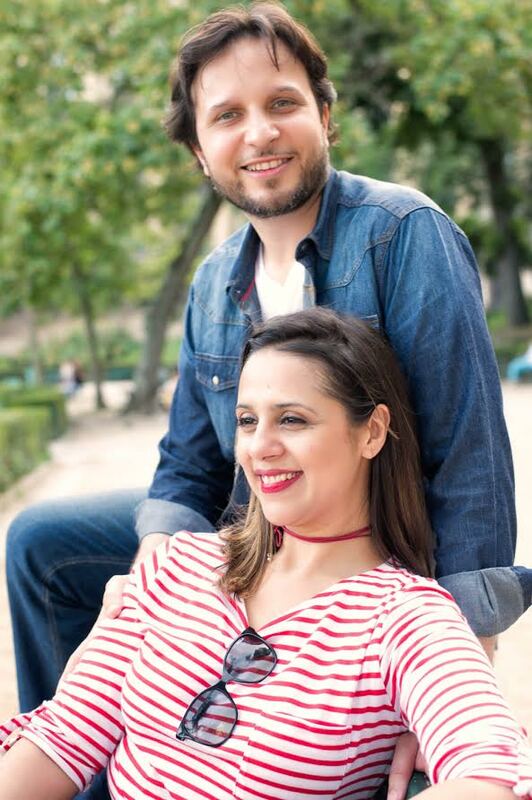 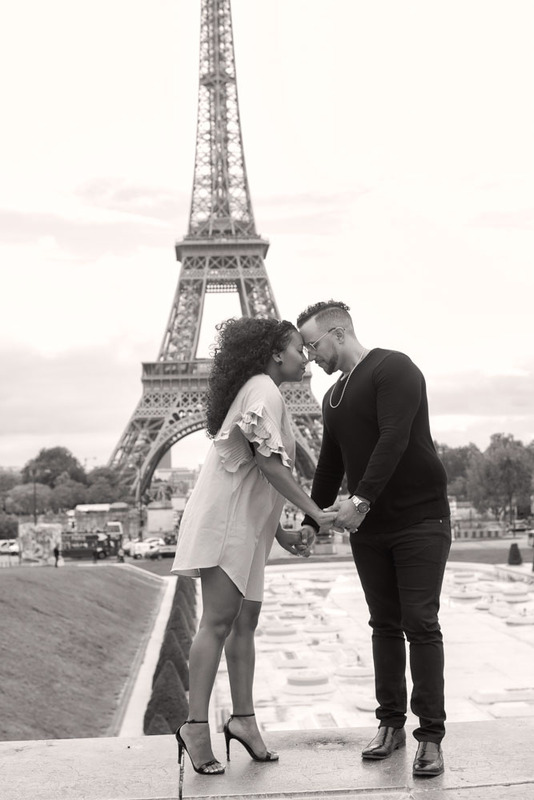 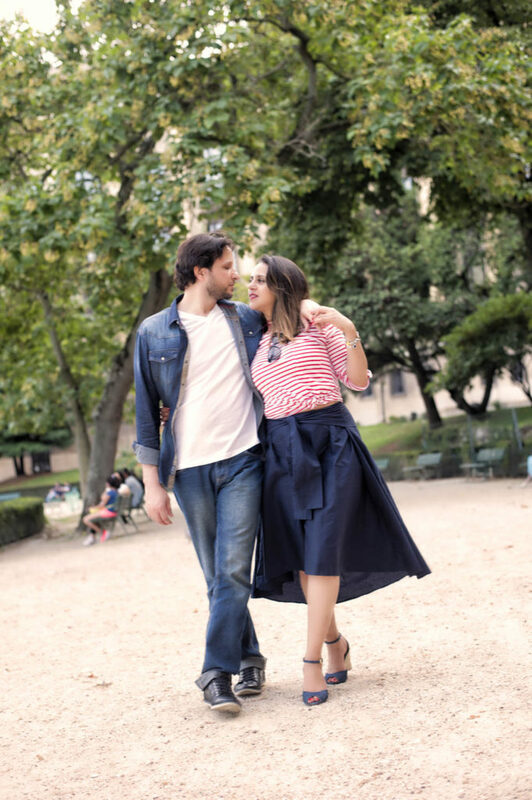 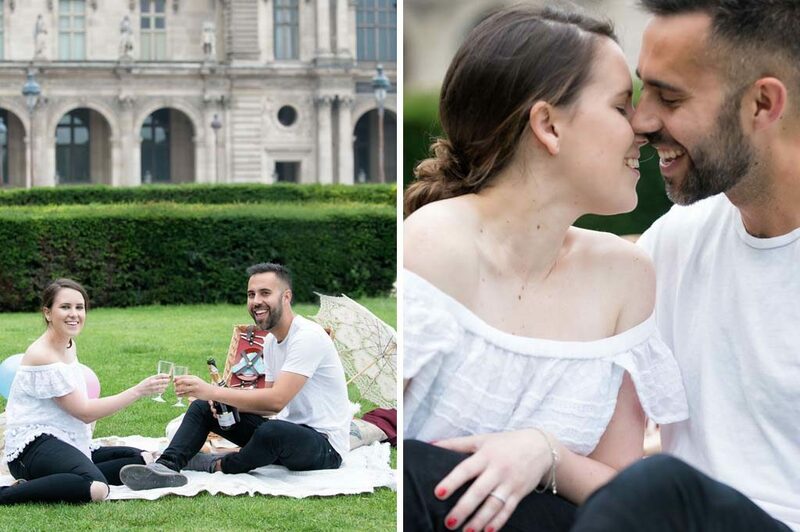 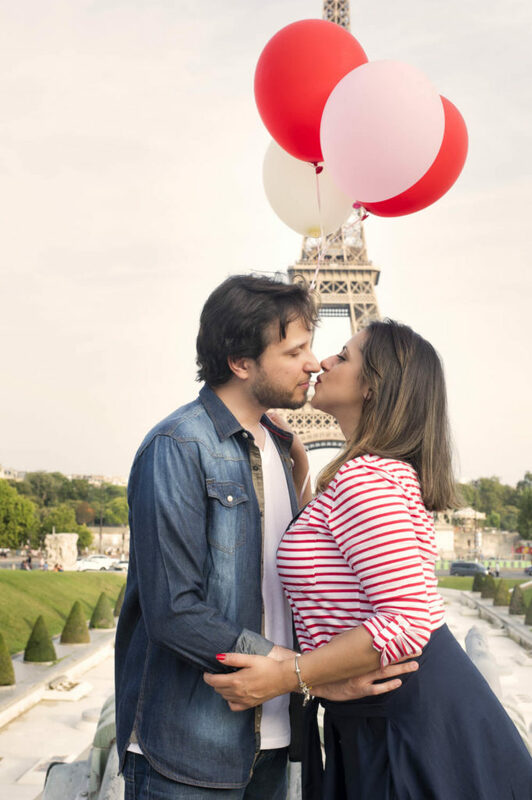 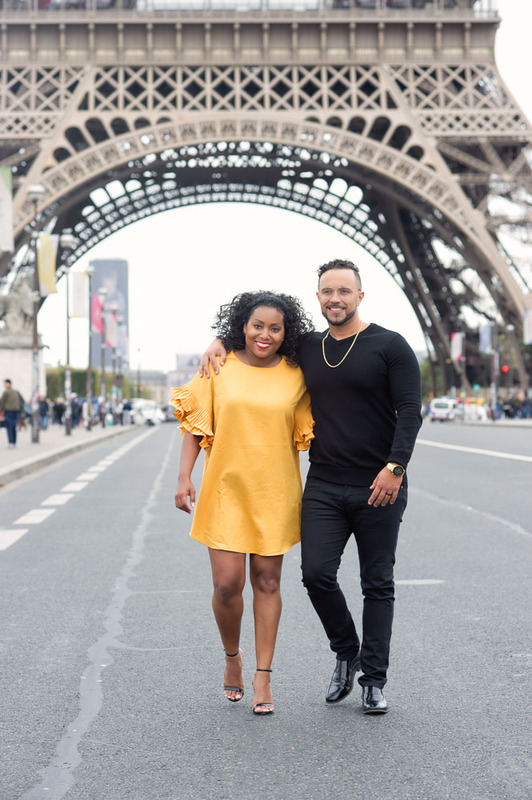 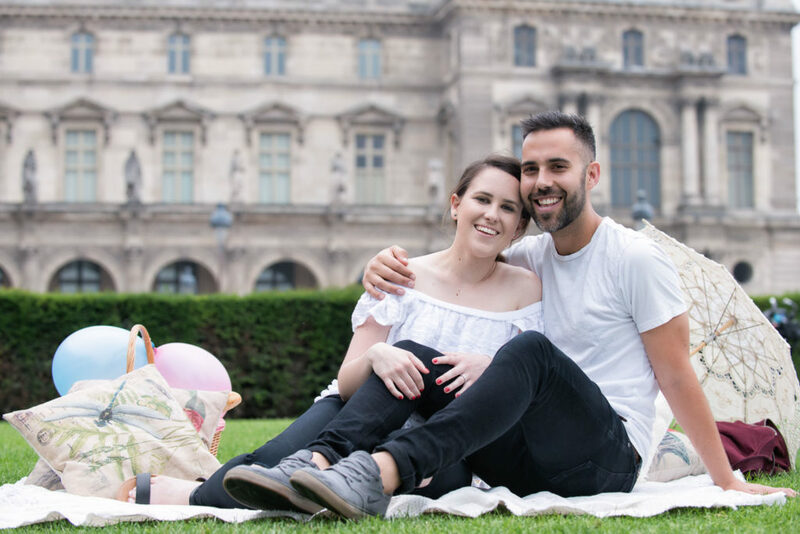 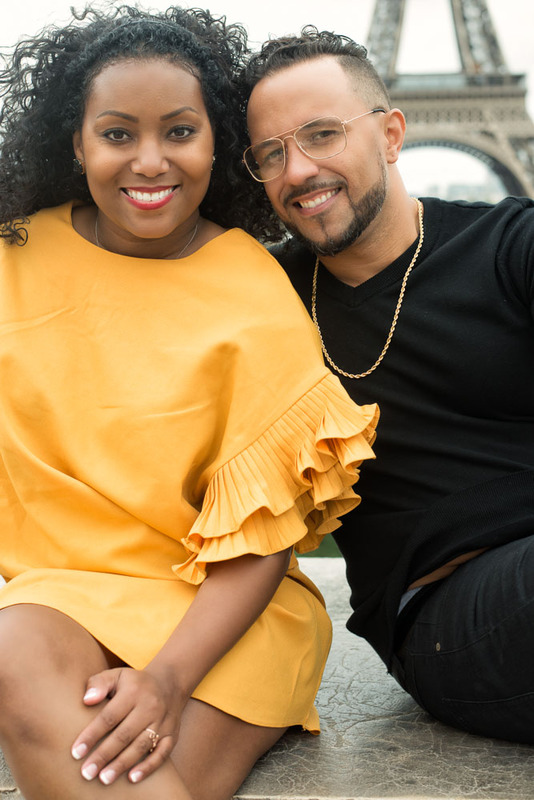 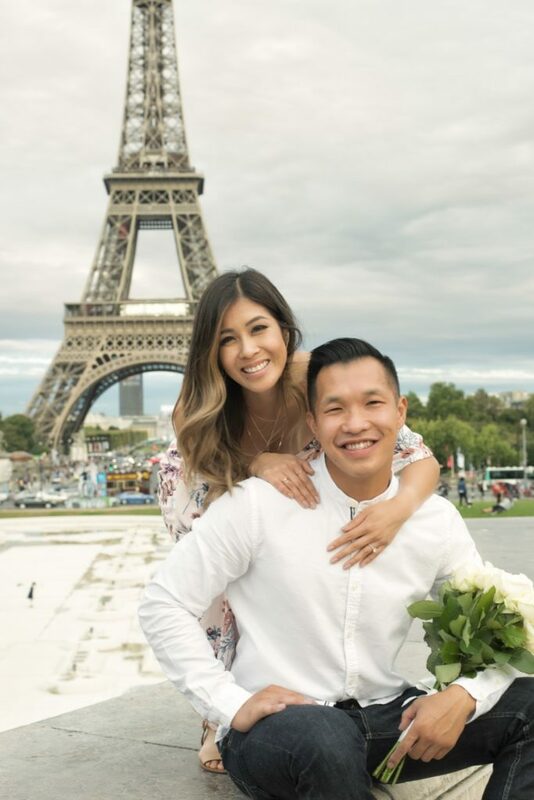 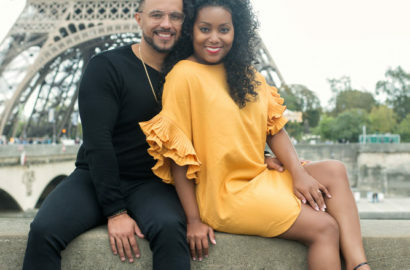 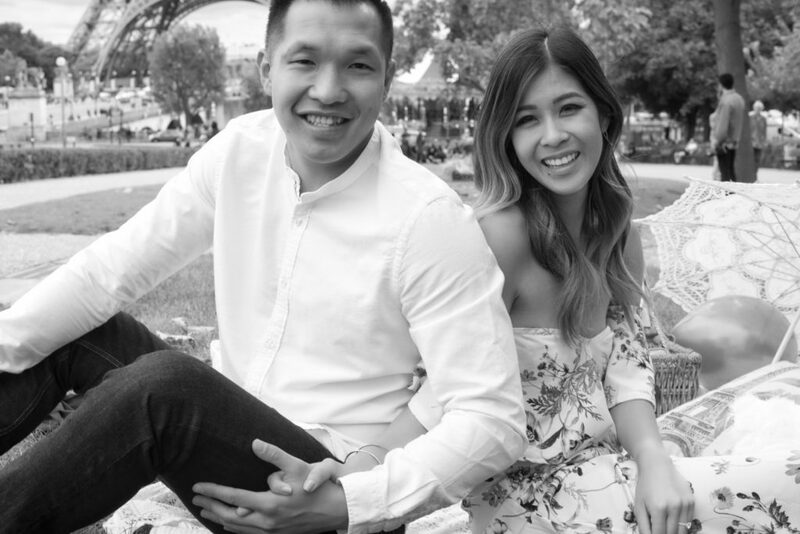 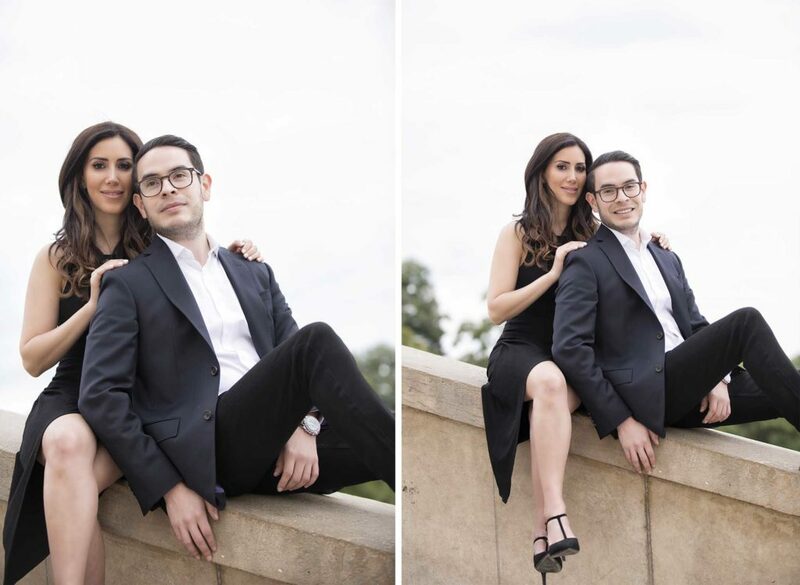 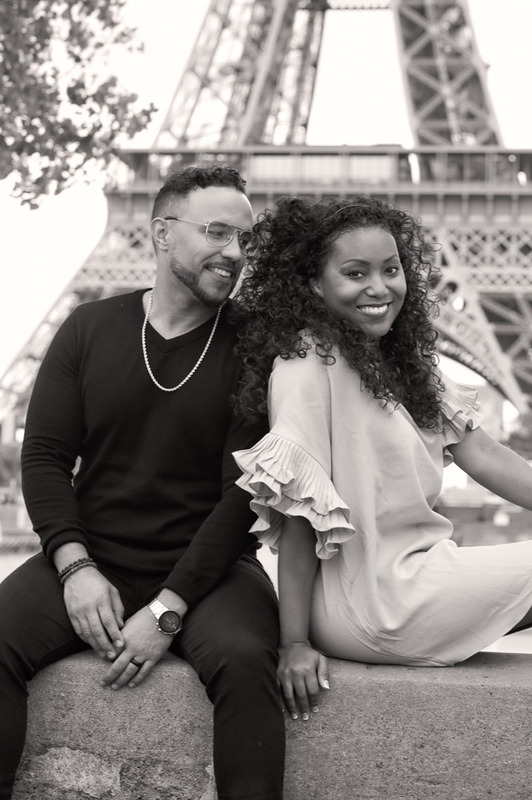 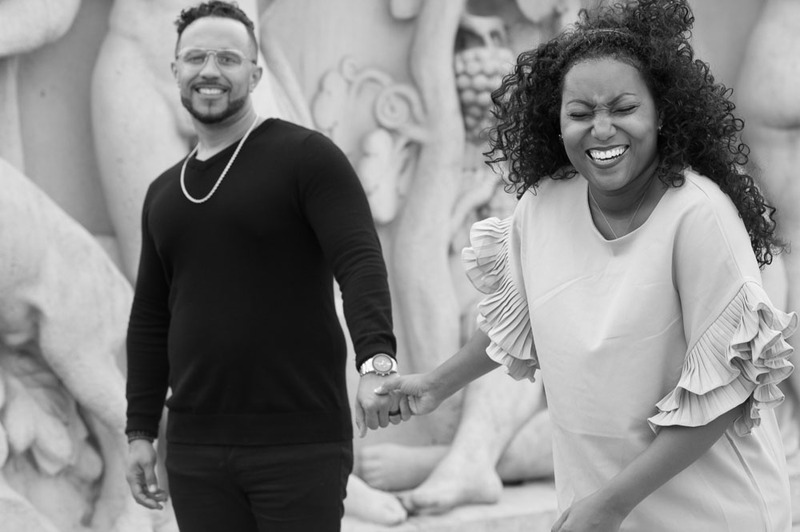 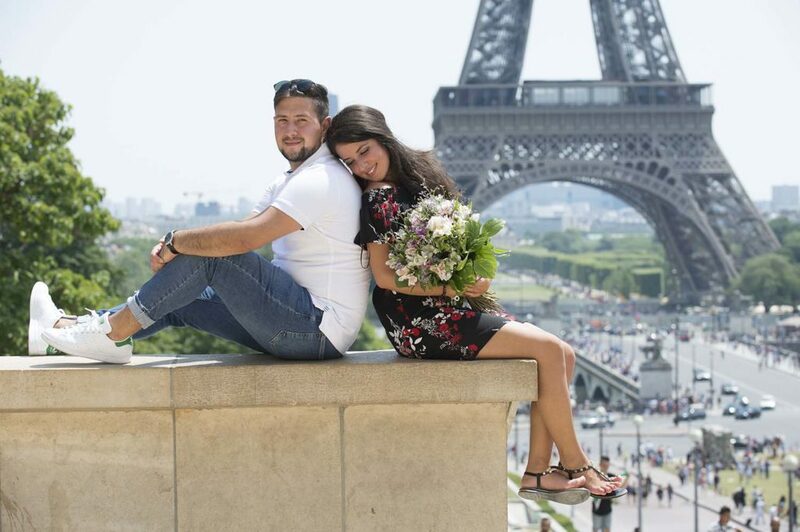 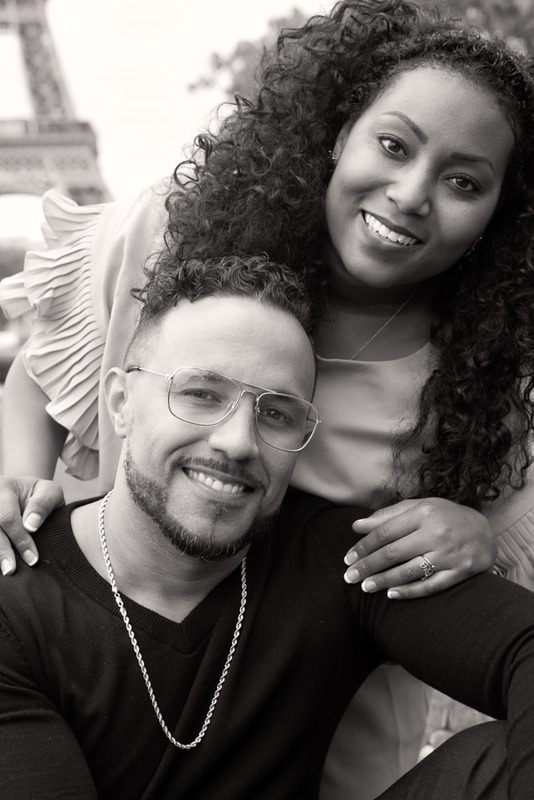 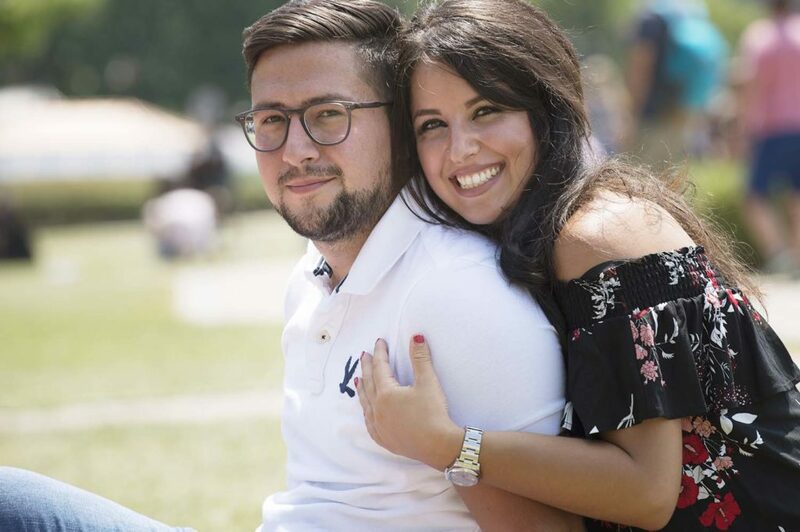 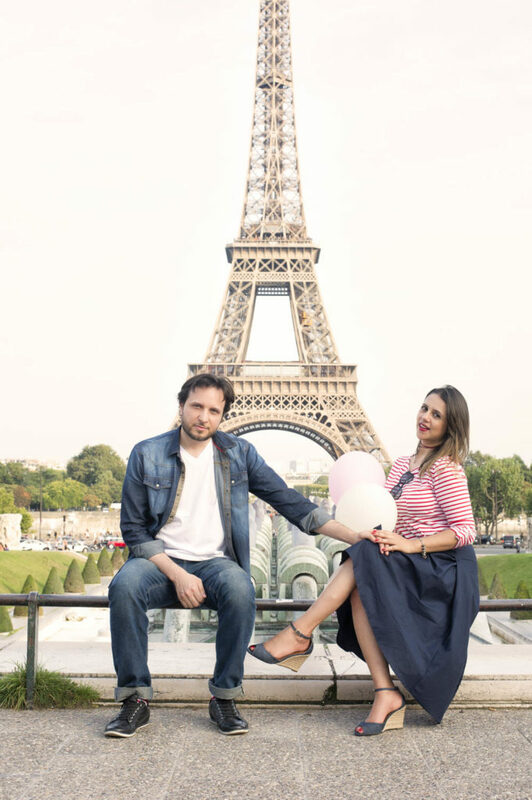 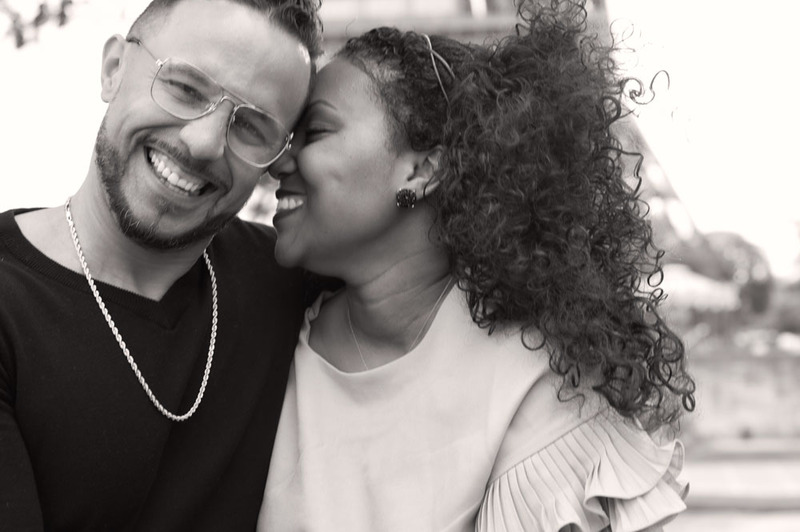 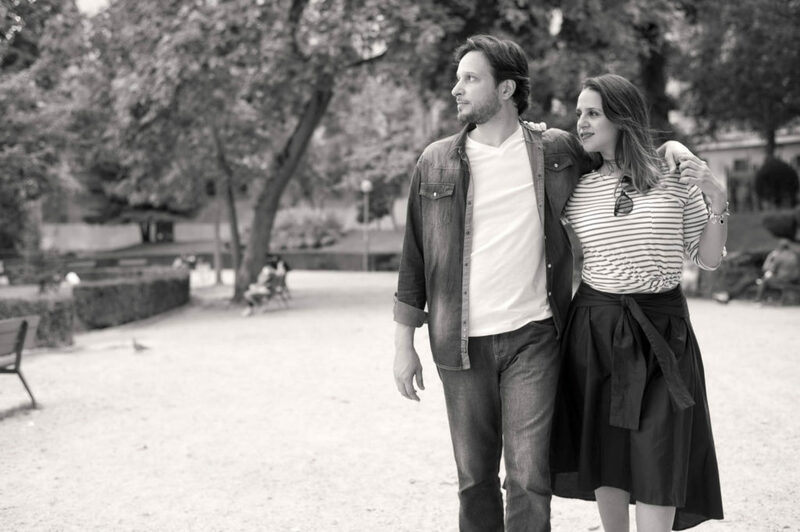 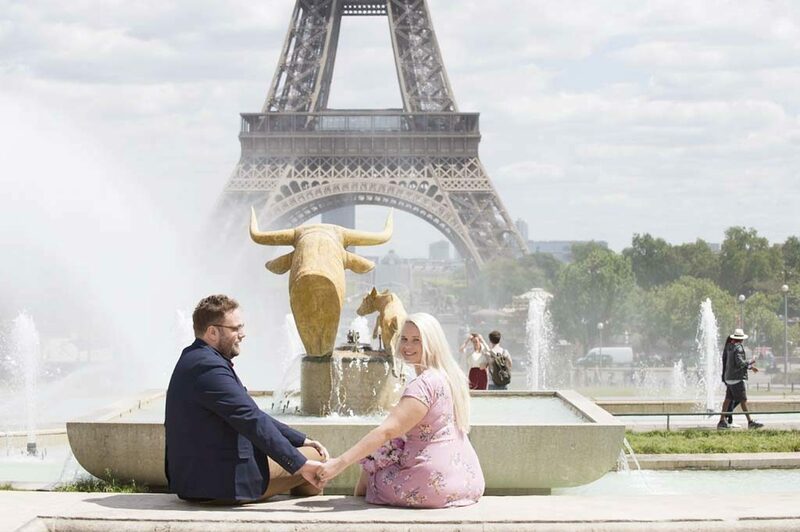 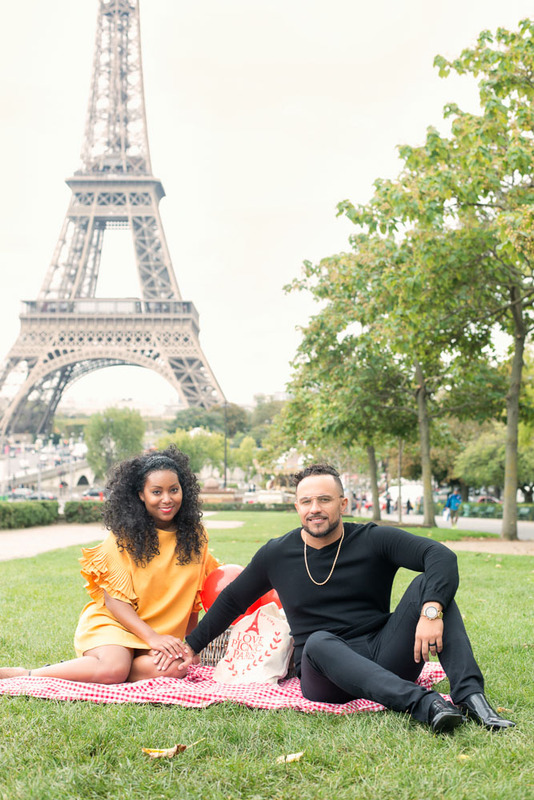 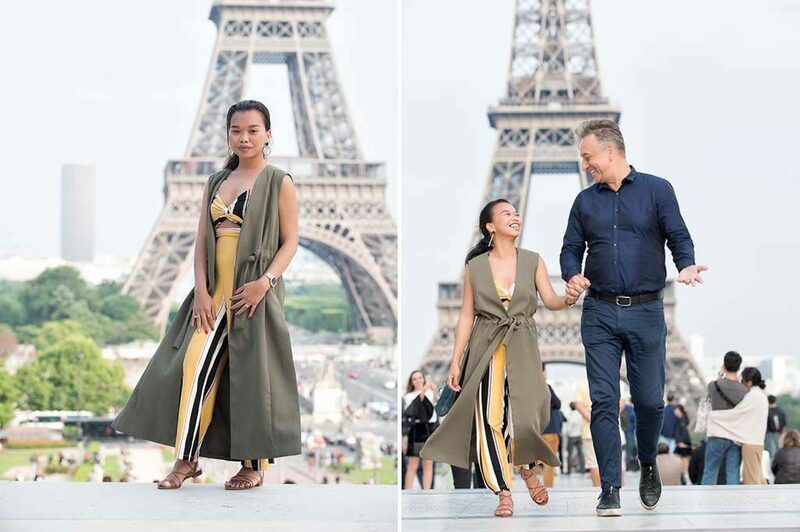 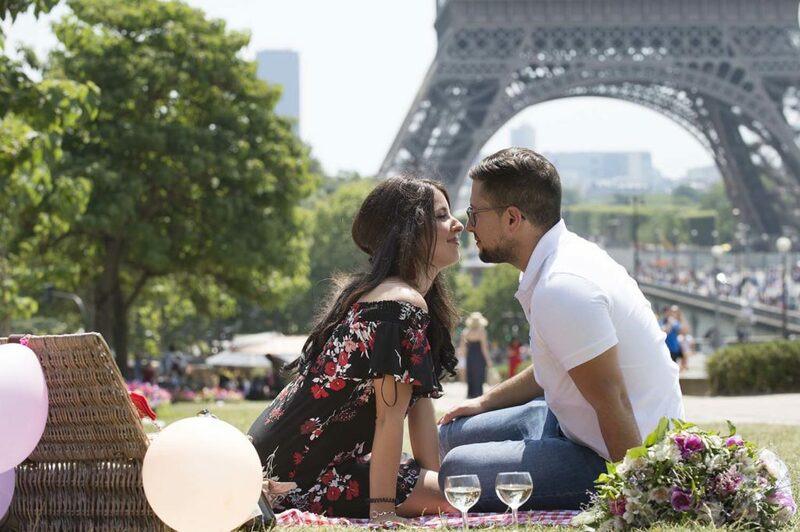 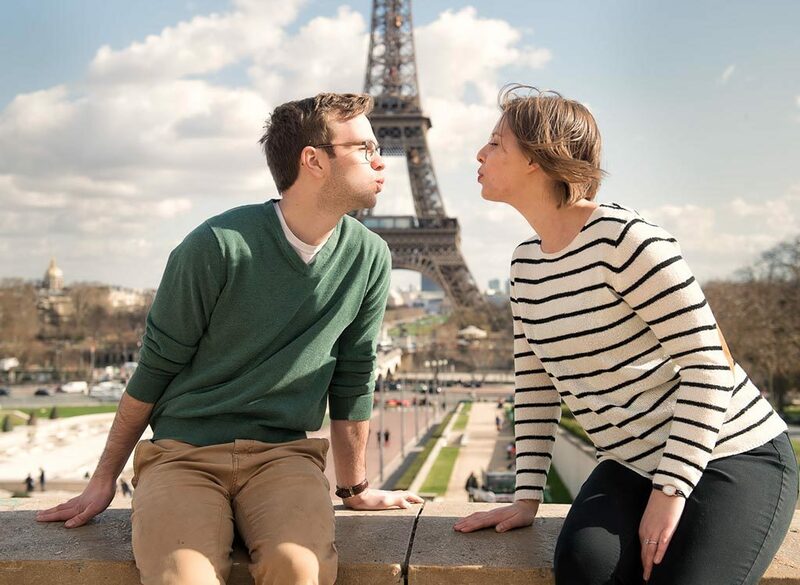 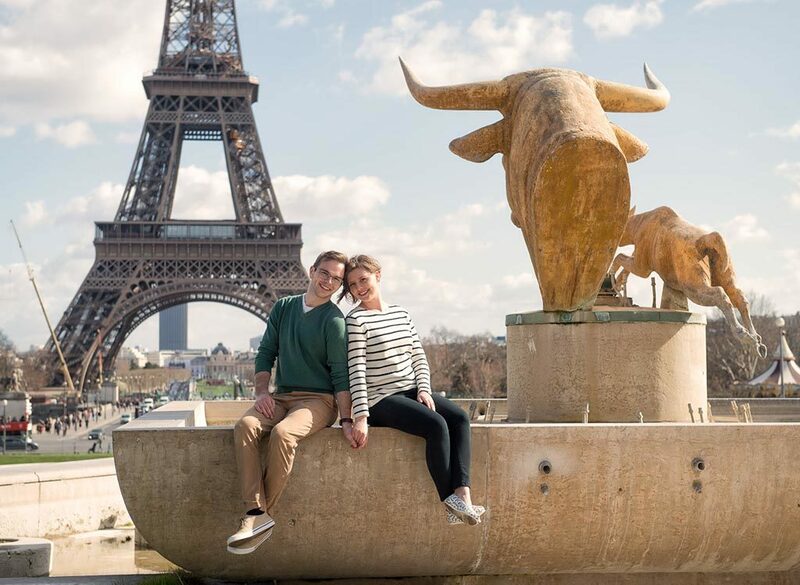 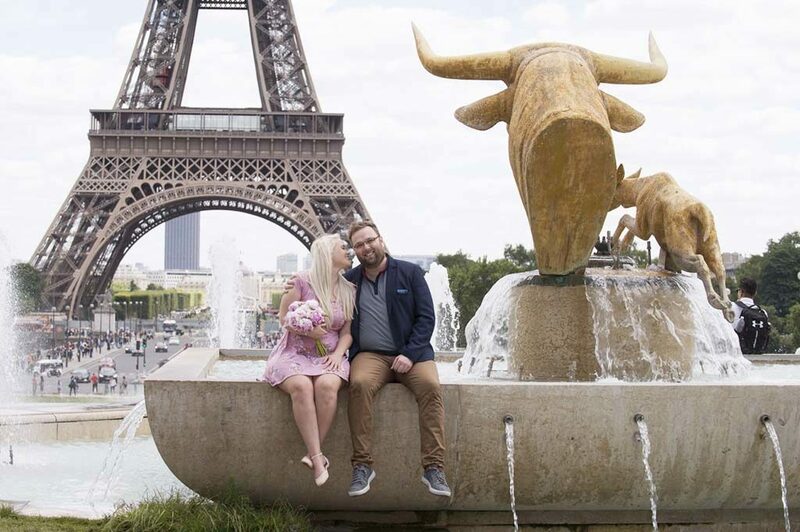 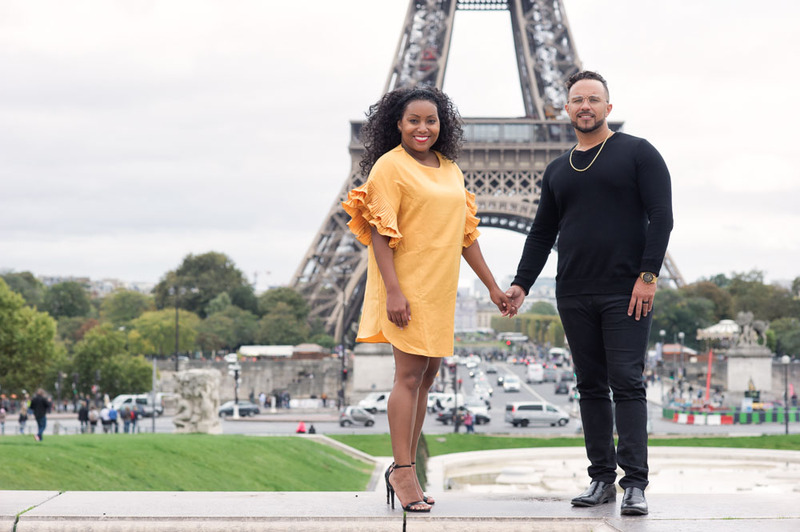 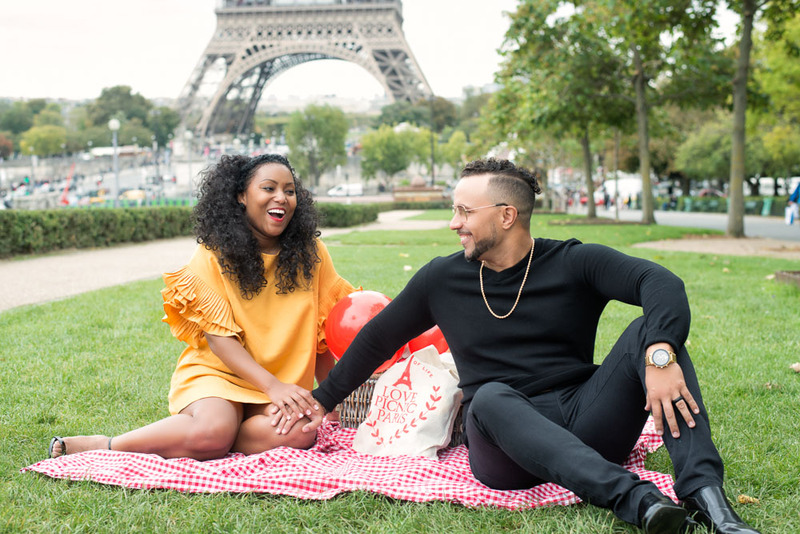 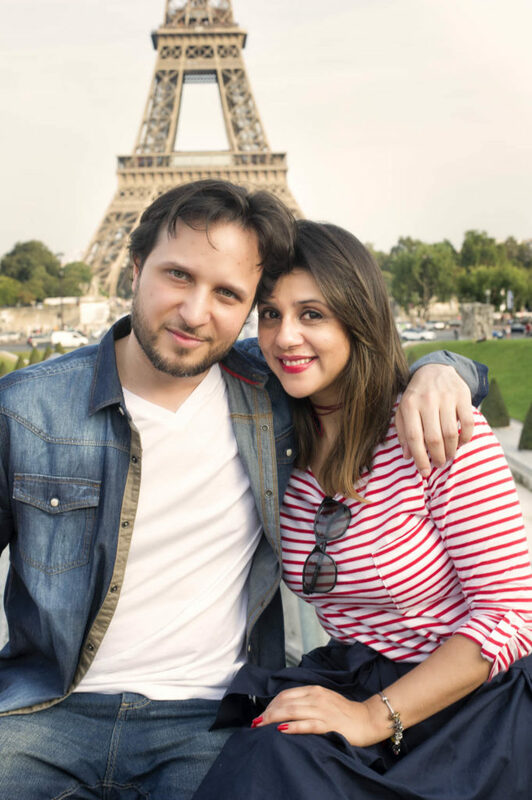 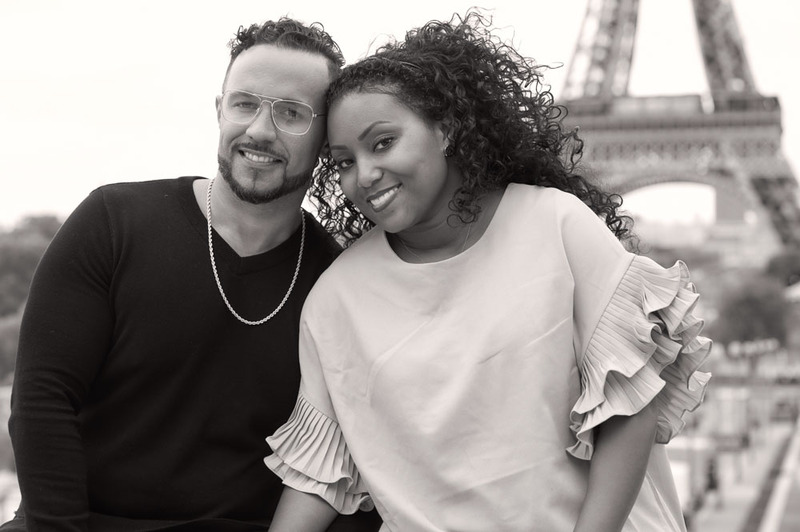 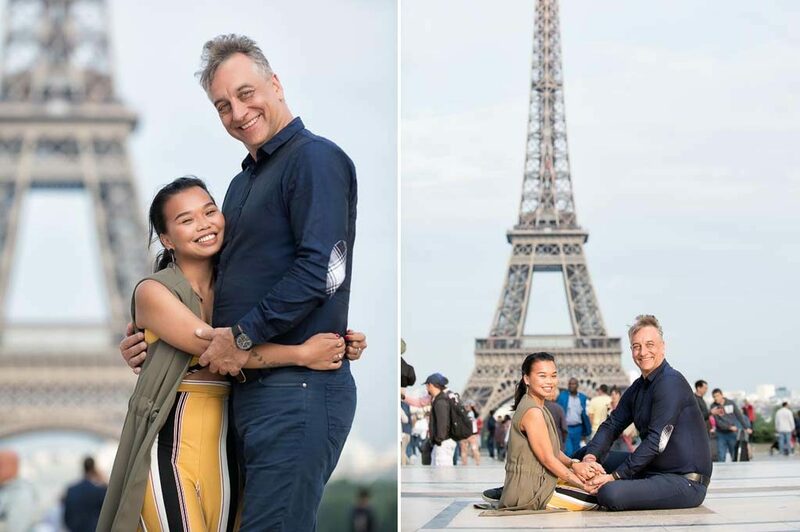 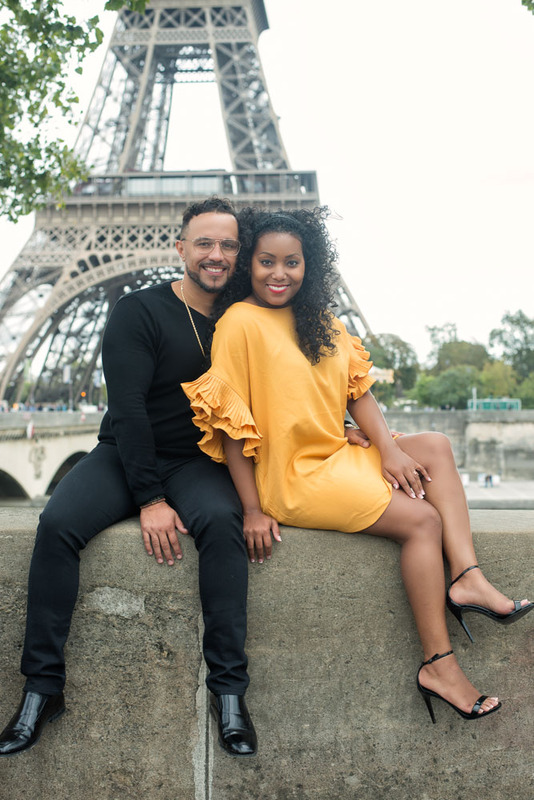 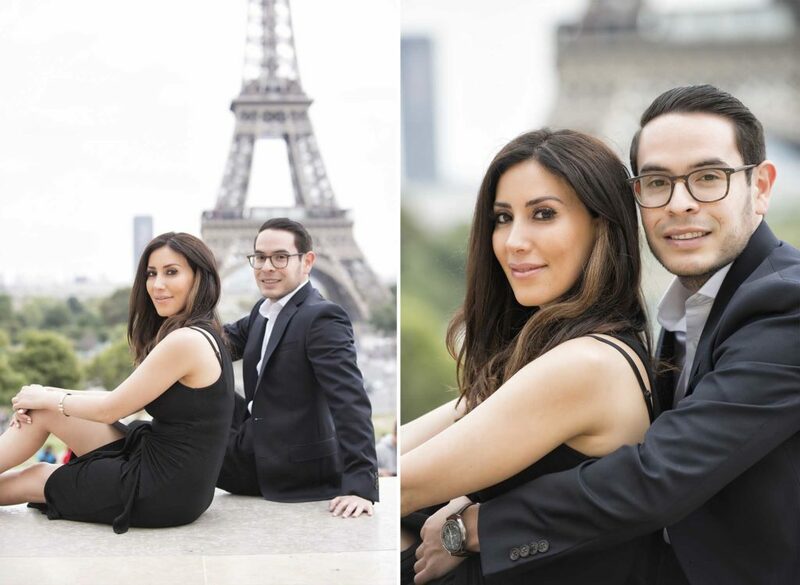 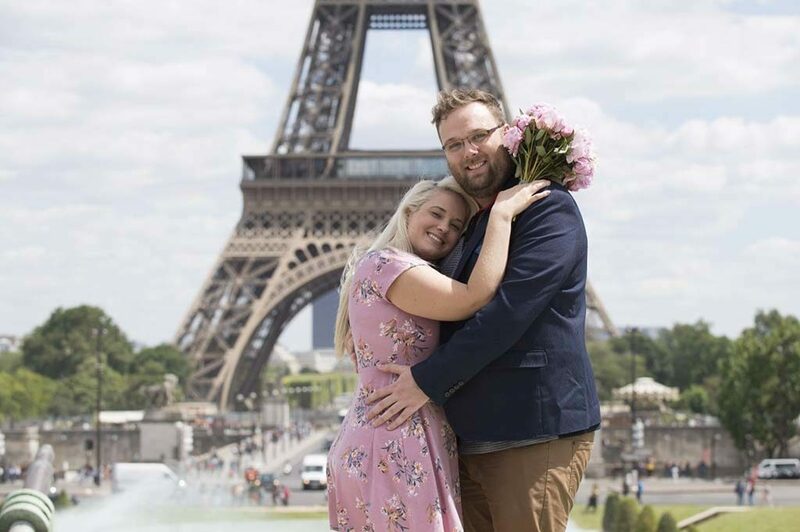 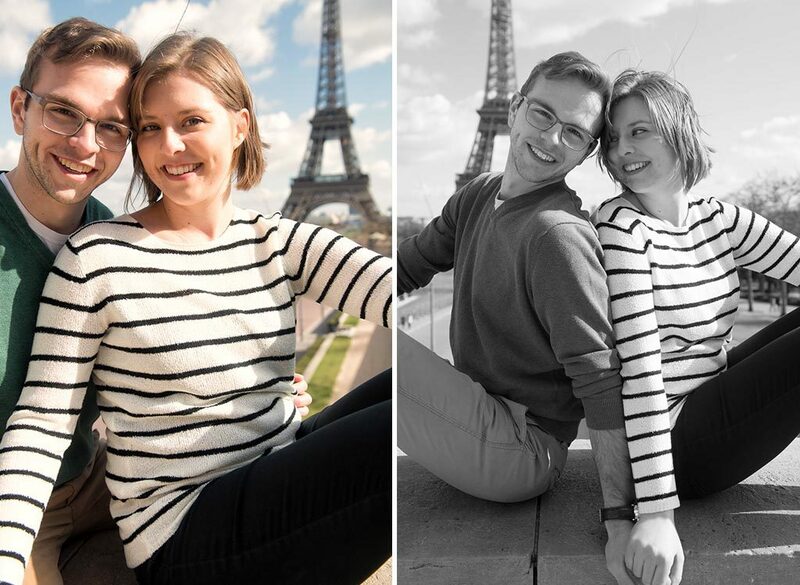 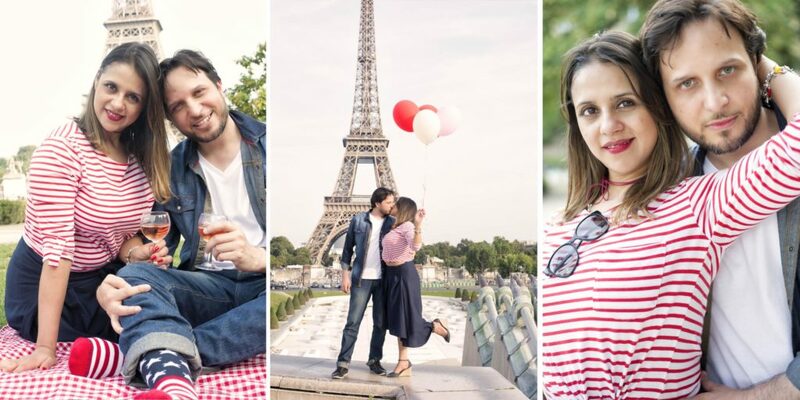 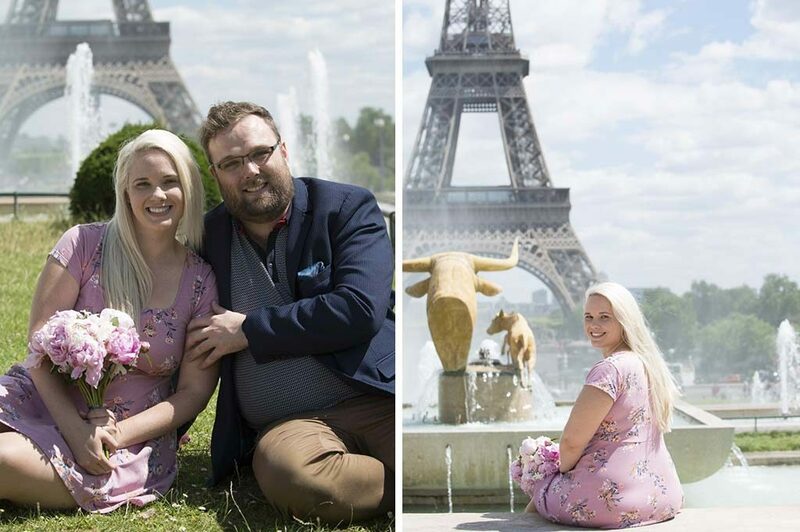 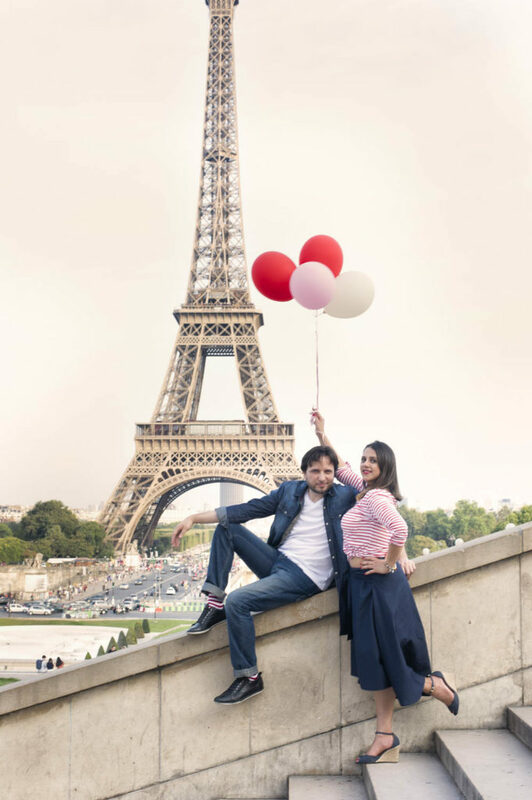 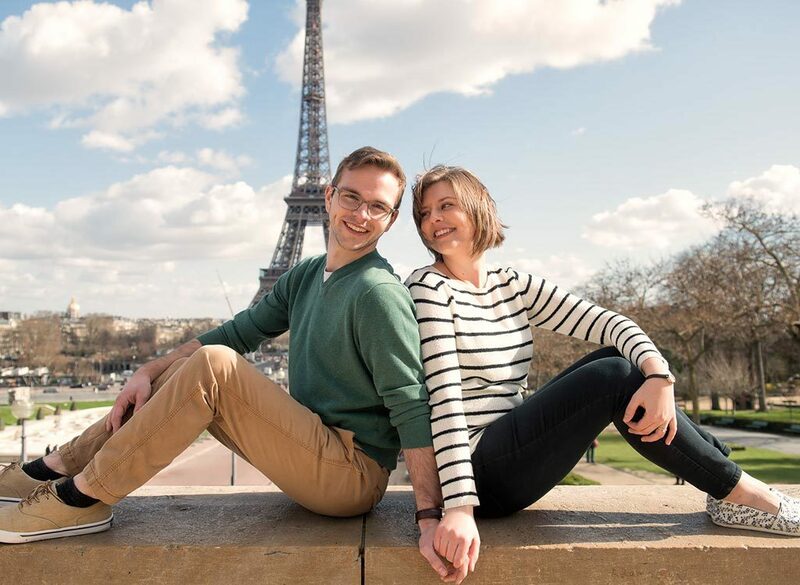 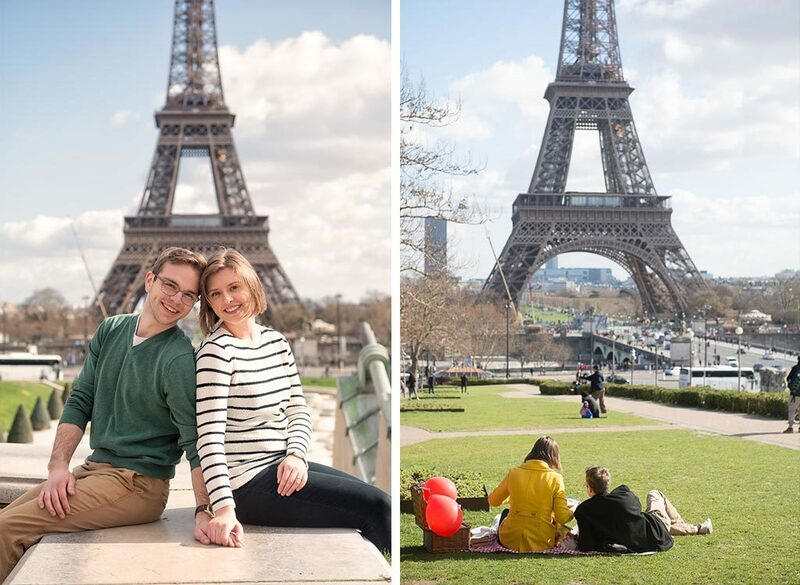 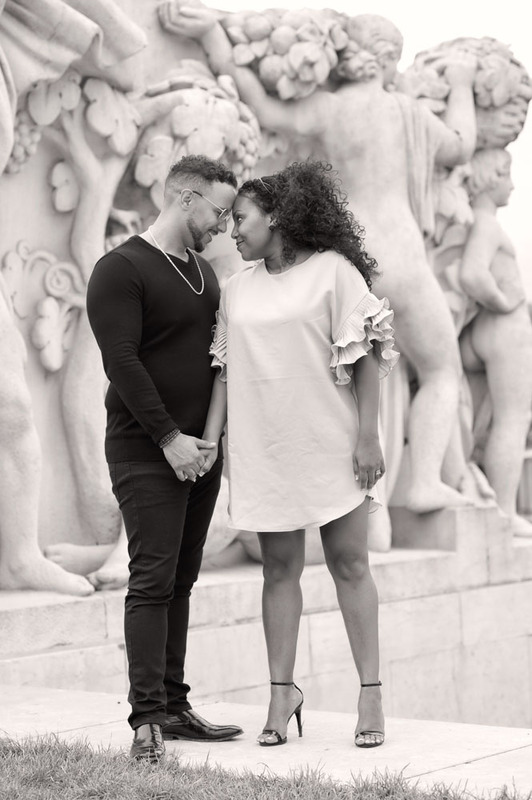 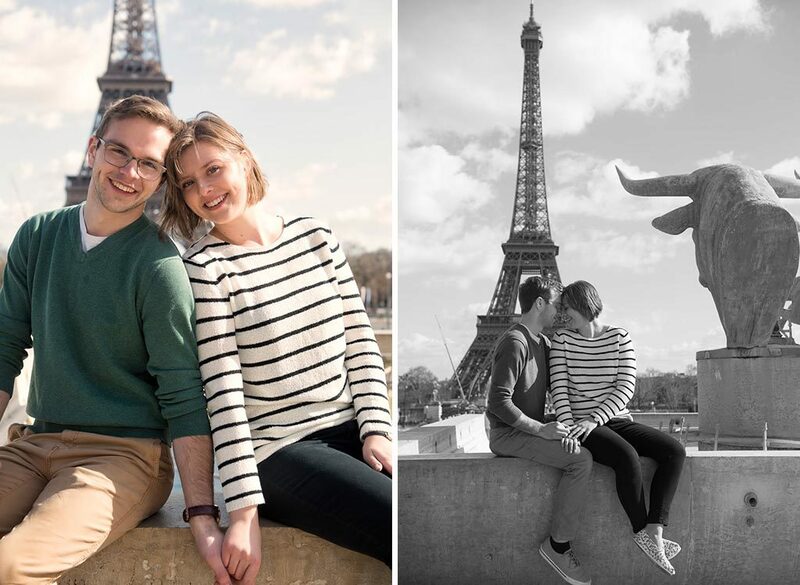 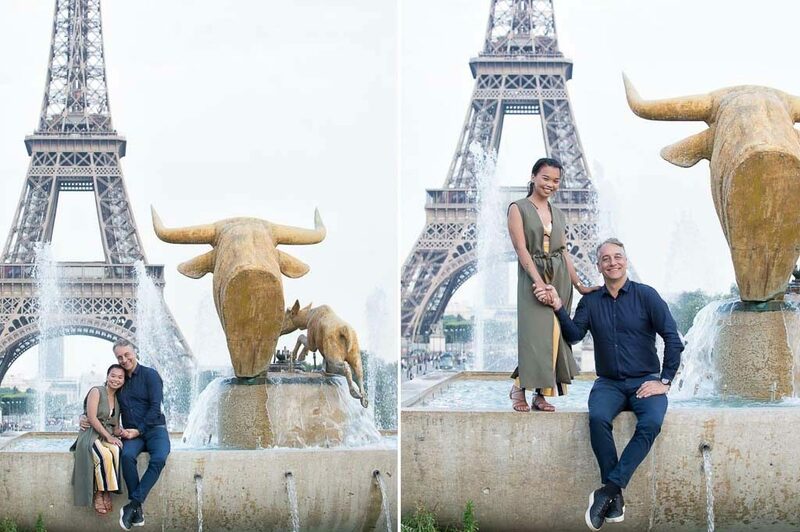 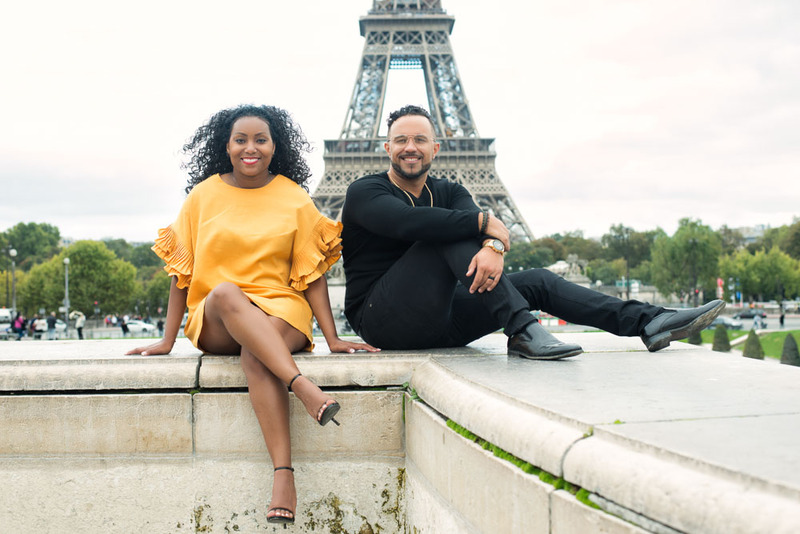 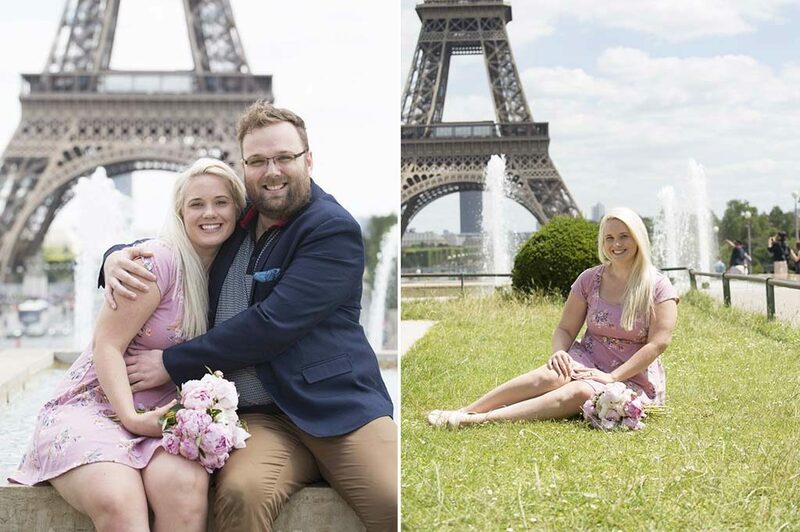 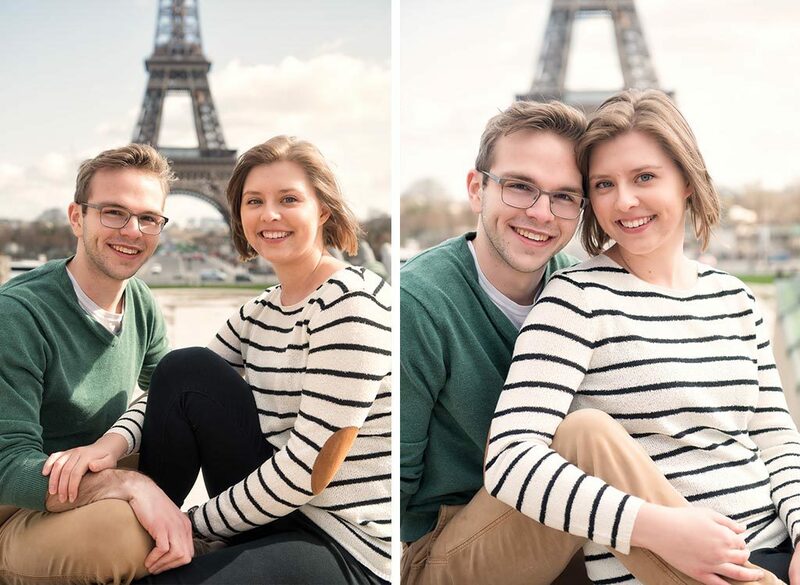 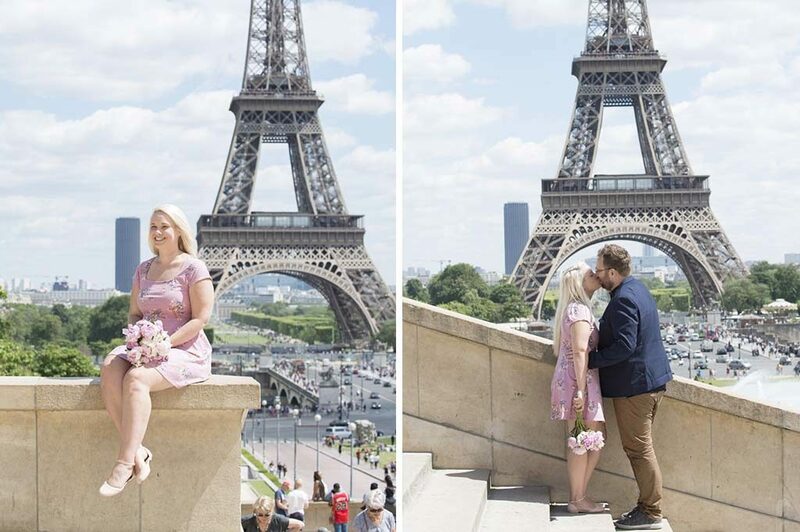 If you are considering having us organize your secret proposal in Paris or a picnic combined with an engagement photo session around the Eiffel tower, you might want to go to our Yelp professional page to read the whole review from the two of them!